New subscribers this week include: Mervyn D Cobcroft, and Harry Schultz. Welcome aboard! We now have 1,855 subscribers. This week we open with more information on NBS events at the ANA convention, updates from literature dealers Fred Lake and Kolbe & Fanning, three new books and two reviews. 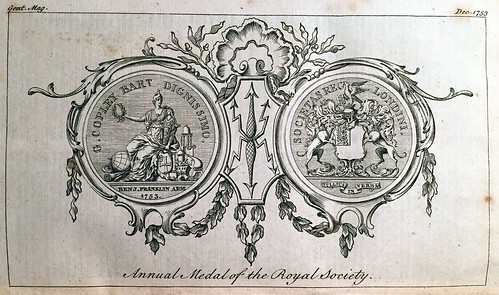 Other topics include miniature numismatic books, Riddell's 1845 Monograph on the Dollar, engraver Emil Sigel, the German cultural property law threat, the Royal Society's Copley medal, medals at the Smithsonian's American Art Museum, a new Brixton Pound note, and Operation Bernhard survivors. To learn more about the Tricentennial Royal, the "Pickett Head" Lincoln portrait, time capsules and cornerstone coins, French arrêts, Presidential Medals of Appreciation, the Honorary Medal of the GIG, bird-shaped coins, Wilson's Numismatic Repository, and the Newman Numismatic Portal, read on. Have a great week, everyone! On Thursday, August 13, the Newman Numismatic Portal (NNP) team will present at the NBS Symposium at 11:30AM. 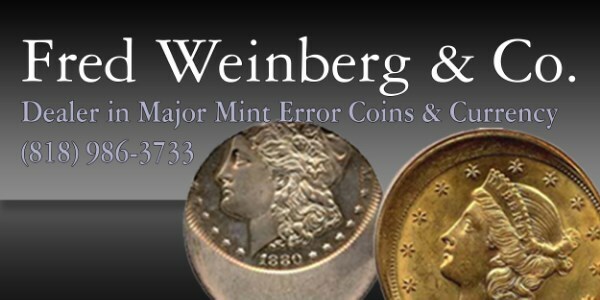 This website, funded by the Eric P. Newman Numismatic Education Society and administered through Washington University in St. Louis, focuses on gathering and preserving numismatic knowledge for the benefit of all collectors and researchers. Project consultants include well-known bibliophiles Len Augsburger, Roger Burdette, John Feigenbaum, Wayne Homren, and Joel Orosz. The NNP team will demonstrate the current website and discuss the roadmap going forward. On Friday, August 14, Dr. Donald Kagin will be our featured speaker at the NBS General Meeting at 11:30 am. Dr. Kagin will be discussing his new book, Profit from Gold and Rare Coins Now, and he will also be speaking about the Saddle Ridge Treasure find from his unique perspective. There will also be reports from the NBS Officers, our annual fundraising auction with several rare and attractive titles, and a few surprises. The prices realized list for our sale #122 has now been published and may be found on the Lake Books web site at http://www.lakebooks.com/current.html There were many good bargains to be found in the 460-lot sale which featured selections from the library of Maj. C. H. “Rusty” Schroeder, especially in the Ancient Coins section of the catalog. Our next sale will have a closing date of October 20, 2015 and will have a number of offerings from the library of David E. Litrenta along with selections from the library of John Tidwell. Kolbe & Fanning have published our latest auction catalogue: Sale 139, featuring selections from the libraries of Margo Russell and Raymond Hale, among other properties. 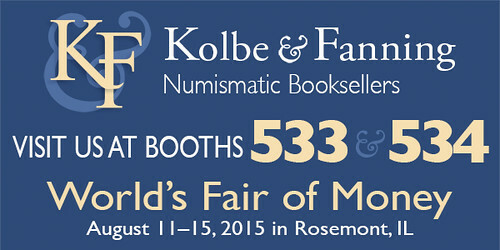 The sale features numismatic literature from around the world, and will be held beginning at noon eastern time on Saturday, August 22. 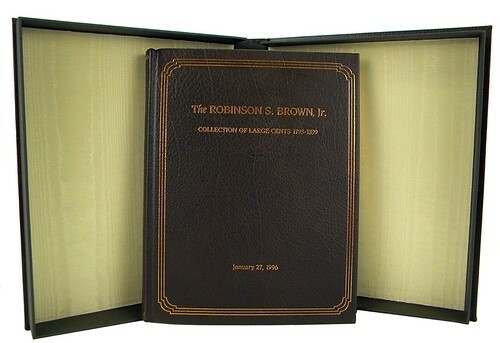 Lot 437: a deluxe leatherbound 1996 Robinson S. Brown sale, one of five issued. 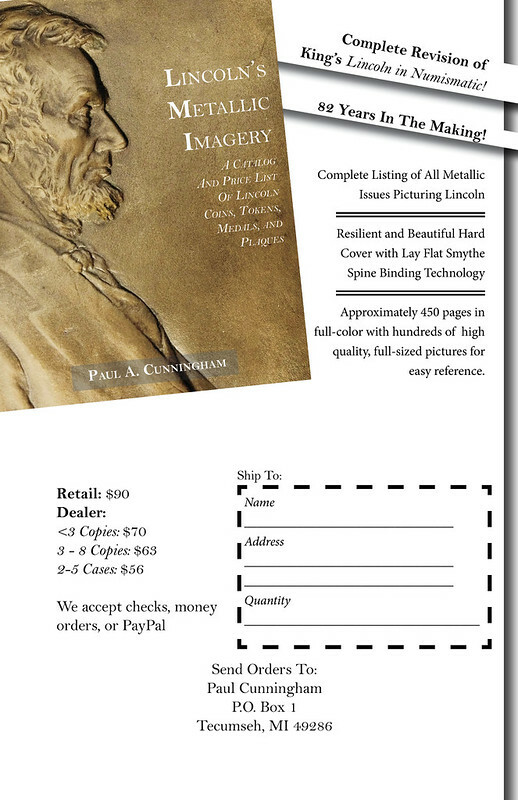 Printed copies of the catalogue have already been mailed to prospective customers. 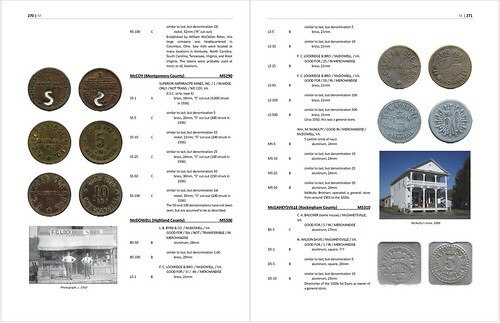 A PDF of the printed version has been posted on the main Kolbe & Fanning website at numislit.com for anyone wishing to browse the sale. 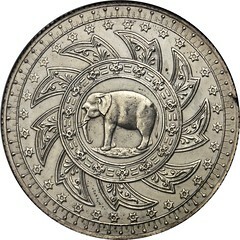 In addition, the sale has been posted to Kolbe & Fanning’s custom online bidding platform at auction.numislit.com, where every lot is illustrated in color and where absentee bids can be placed at any time prior to the sale. The live sale will be conducted on the auction.numislit.com site. As a reminder, bidders may participate in this sale in a variety of ways. Please feel free to send us your bids in the regular mail or send us an e-mail. Give us a call or send us a fax. 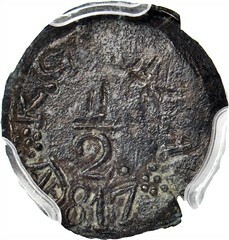 For those who prefer the experience of live bidding, please check out our live biding platform at auction.numislit.com. Register in advance of the sale and browse the lots at your leisure: all lots are illustrated in the online catalogue. Absentee bids can be placed in advance, allowing participants to not worry about remembering the sale or finding themselves unexpectedly occupied on the day of the sale. Bids will be reduced as competition dictates and the privacy of your maximum bids is maintained. COLLECT BOOKS AS RARE AS YOUR COINS. The 2015 and the 2016 editions of the leather-bound Limited Edition Red Book are both available now. Print run: 500 copies each. 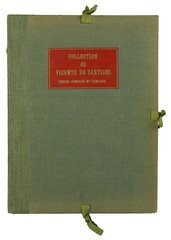 Hubbed-spine, gilt-edged, library-quality volumes in an enlarged trim size, numbered individually and autographed by Red Book Senior Editor Kenneth Bressett. 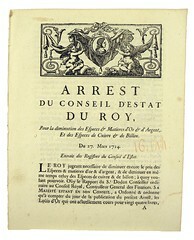 Earlier editions have sold out with much higher print runs. $99.95 each at Whitman.com or call 800-546-2995. This project stuck in a corner of my brain until about 2005. I mulled over the whole idea and decided to ask some friends of mine to help make “it” happen. I asked Fred, David Schenkman and Kathy Lawrence to help and they said yes. We would work on this project as a TAMS venture. After a lot of foot-dragging and foul language, we made timid steps forward, all the time wondering why we would try such a daunting task! Fred’s contributions, by any measure, were just magnificent. As a long-time collector and Lincoln-phile, Fred was the perfect associate. He sent loads of great Lincoln pictures, all metal, to use at my discretion. He shared with me his research on several topics, like the four different camera views, one of which would be recognized as Brenner’s cent and the various large plaques, each of which would demonstrate the Gettysburg Address in one of the four recognized versions of the Address! He would offer his ideas and thoughts on anything I wrote. Kathy’s help was –ephemeral! While commenting on this or that she would suggest something, like a different word to describe something or a phrase that made more sense than what I had done. Dave’s contributions were more like a batter in a “clean-up spot” or a defensive back chasing down a runaway halfback. He gave the manuscript a final examination, pointing out things that had been overlooked. The overall effort was slowed when we heard of Fred’s illness in December of 2013. He was totally disabled and we all thought the worst. Fred, meanwhile, had been making remarkable progress in rehabilitation all the time and today is able to read and communicate in his family. I want to thank these three and my younger daughter, Laura, who did all the formatting and photography massaging, and the scores of people and businesses who contributed listings or pictures for the final product. The book project is done! The printer is expecting to put the finished books on a truck to Michigan this week. We are all relieved to see it done! When I was teaching in public schools in Michigan, we often talked of doing projects or learning experiences happening in 20 minutes. Staying focused on one job for nearly 10 years was hard work! In doing the book, I have learned more about Lincoln than I can process! I have learned the background of the gold death medal (9-01X), which was financed by the people of France and presented to Mary Lincoln after the assassination. Did you know that the Emperor of France would not allow the medal to be struck in France? The Grand Old Army held annual conventions for many years after the War ended. 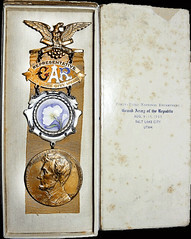 This was a particularly attractive medal (11-970) for the G.A.R meeting in Salt Lake City in 1909, Lincoln’s birth centennial year. 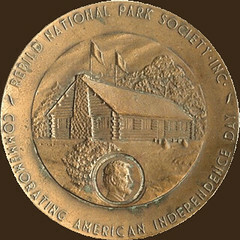 The medal (13-12) celebrating the Rebild National Park in Denmark is quite unusual; it commemorates the meeting of the largest July 4 celebration outside the United States! The Republican conventions would honor Lincoln many times; this badge (14-34) had Lincoln under glass, on a metallic frame. 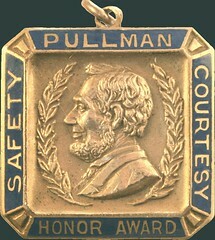 The Pullman Company, famous for its railroad cars, issued this small award (19-72) with Lincoln’s effigy on it. 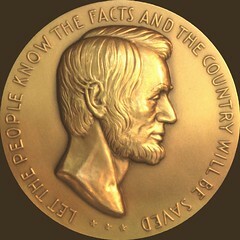 The Pittsburg Press (earlier on) and Pittsburgh (later) awarded Lincoln essay medals from about 1910 to 1930, all in even-numbered years; the Press awarded medals in odd-numbered years for what famous American? 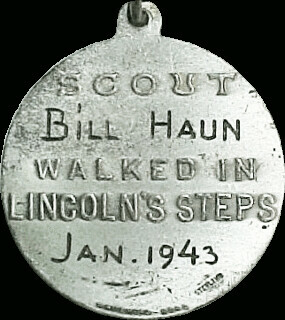 The Boy Scouts were always marching around! Some of these badges (23-203) were awarded for completing a 17 mile hike. When I was a boy scout, I had an opportunity to do one of these hikes; I graciously declined! 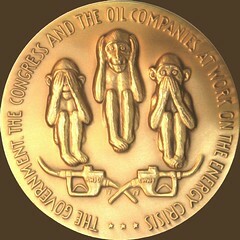 Our Friend Robert Julian produced four of these “comment” medals (30-52); this one inquired about our energy concerns. One of the few non-metallic items in the book (35-33) was this convention badge; very attractive but not metal! Another non-Lincoln medal (36-65), this was given to Captain Edward P. Doherty of the 16th New York Cavalry; he led a group of 29 soldiers which tracked down and captured John Wilkes Booth and an accomplice several days after the assassination. The solid gold pin-bar and the hanging solid gold medal are presented for photographic purposes with a modern ribbon. Of all the Lincoln stuff that I had myself photographed, this medal was the most impressive - Just think, this medal was awarded to the guy who caught the guy who killed the President!" I want to thank Fred, Dave and Kathy and my younger daughter, Laura, who did all the formatting and photographic massaging, and the scores of people and businesses who contributed listings or pictures for the final product. United States Mint® numismatic discoveries has been limited to the physical identification of a new error, new variety, or newly found hoard. The discovery of an entirely undocumented United States Mint® series is virtually unheard of in U.S. numismatics; however this seemingly impossible feat has been achieved. An entire United States Mint® series has been discovered and cataloged for the very first time. 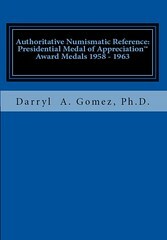 Dr. Gomez numismatic research findings are documented in his recently published book titled, Authoritative Numismatic Reference: Presidential Medal of Appreciation™ Awards 1958 – 1963, ISBN: 1511786744. This book is the first to document general numismatic information for the entire series of twenty-two Presidential Medal of Appreciation™ award medals. Dr. Gomez reveals that between 1958 through 1963, the United States Mint® periodically designed, manufactured, and issued “special Government medals” to the White House Office. These “special Government medals” were created for and awarded by the President of the United States. The United States Mint® has been cognizant in the fact they functioned in a supplier role to the White House Office and do not have full details in how the medals were used or the exact purpose of the medals. Due to this fact, they have engaged in a non-disclosure policy with these “special Government medals” for the last 56 years and continue to do so today. In 1961, a staff member in the White House Office transferred active files relating to the “special Government medals” to his personal records to function as the executive assistance for President Eisenhower after he left office. These records were essentially sequestered from both the U.S. Government and public for fifty years. In 2011, the family of the staff member donated the records to the Dwight D. Eisenhower Presidential Library and Museum for proper historical archiving. The United States Mint® non-disclosure policy and the sequestered White House Office records are the primary reasons for the 56 years information gap relating to these presidential award medals. In 2013, Dr. Gomez was the first numismatic researcher to access the sequestered White House Office records and resulted in the initial cataloging of twenty presidential award medals. In 2014, two medals from the John F. Kennedy presidency fit the medal classification criteria and were added to presidential award medals series. Currently, no other U.S. President has been identified with a United States Mint® appreciatory “special Government medal”. Both the United States Mint® and the White House Office have neither designated an official name to the individual medals nor a name for the entire series of the medals. Dr. Gomez has applied for a trademark with the United States Patent and Trademark Office (USPTO) for the adjectival phrase, Presidential Medal of AppreciationTM. 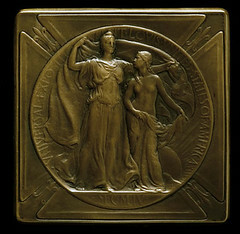 Presidential Medal of Appreciation™ was created to function with the nouns: Award Medal; Award Medal Series; and so on, to indicate a badge of origin for the numismatic research discovery and initial collective grouping of previously unknown types of United States Mint® “special Government medals” that were created for and awarded by the President of the United States. Other Notable Facts from Authoritative Numismatic Reference: Presidential Medal of Appreciation™ Awards 1958 – 1963, ISBN: 1511786744. 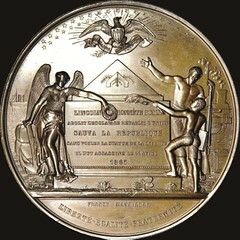 All medals were designed and manufacture by the U.S. Mint in Philadelphia. 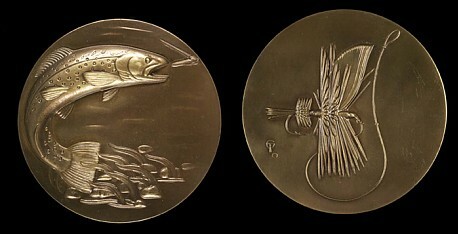 Gilroy Roberts and Frank Gasparro were the designers of the Presidential Medal of Appreciation™ Medals. On May 1, 1960, a United States U-2 spy plane was shot down over the Soviet Union airspace. This cold war event resulted in collapse of the Paris Summit and the destruction of three gold medals (Gomez identifier DDE-C3-01) was to be awarded to the attending Heads of State after a successful conference. The medals were never awarded and returned to the United States for destruction by the United States Mint®. On June 10, 1960, the Haggerty incident (United State Marine helicopter rescued White House Press Secretary due to riots in the newly signed United States and Japan defense treaty). Protection of the upcoming visit of the President could not be guaranteed and subsequently President Eisenhower made a last minute decision to cancel his visit to the nation of Japan. 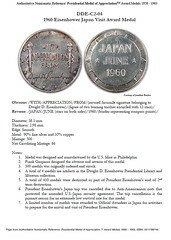 Majority (410 of the 500 original struck) of the Japan medals (Gomez DDE-C2-04) were returned to the United States and destroyed by the United States Mint®. The Presidential Medal of Appreciation™ Medals were awarded in 26 countries. These countries include: Afghanistan, Argentina, Brazil, Chile, France, Germany, Greece, India, Iran, Ireland, Italy, Japan, Mexico, Morocco, Pakistan, Philippines, Portugal, South Korea, Spain, Taiwan, Tunisia, Turkey, United Kingdom, United States of America (numerous States), Uruguay, and Vatican City State. The medals were awarded by President Eisenhower or President Kennedy during their presidential visits during their tenure in office. The 1960 Eisenhower State of Hawai’i Visit Award Medal (Gomez DDE-C2-07) was awarded during President Eisenhower visit to the State of Hawai’i during the period of June 20 - 25, 1960. Gomez DDE-C2-07 is the first United States Mint® product to bear the State of Hawai’i as a design element (not to be confused with the Kingdom of Hawai’i issues). Here's a larger image of one (cropped from the sample page above). I can't say I'd ever seen or heard of these medals before Gomez' earlier book on the Eisenhower Appreciation medals, although of course, these have been available in hobby circles for years and have been cataloged in sales by medal dealers such as Joe Levine. I've included all the release's trademark symbols, although I'm skeptical of the need or ability to trademark an otherwise generic name for the series. I'll have to get the book to learn more. If these are given at the sole discretion of the President, does that make them more like military challenge coins? Other national medals have strict rules, procedures and committees for being awarded, the highest honor being the Congressional Gold Medal which requires, well, an Act of Congress. I've been in briefings with the director of a government agency, and at the end of the meeting a flunky came by with box full of the director's coins, and they were handed out to everyone like candy on Halloween. On which end of that spectrum do these “special Government medals” reside? 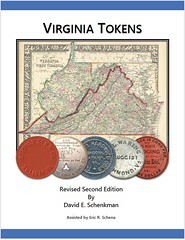 In 1980, David Schenkman’s Virginia Tokens was the first work to document the trade tokens from the Commonwealth and helped set the standard for state token catalogs nationwide. Now, thirty-five years later, the second revised edition is ready. Tokens in Virginia have a long and distinguished history and offer the exonumist a wide spectrum of specialties. From Hard Times store cards, transportation tokens dating back to the 1860s, coal scrip, to trade tokens and picker’s checks, Virginia Tokens seeks to document the many varied aspects of exonumia throughout the state in a convenient and easy to use format. With nearly 6,000 different tokens listed from roughly 2,250 different merchants located in approximately 770 towns, the new 2015 revision more than doubles the number of known listings from the original catalog. The revised second edition includes an expanded introduction that features a history of tokens in Virginia, as well as details on several of the principal token manufacturers. In addition, tips on collecting will benefit both long-time specialists as well as novices to the field. The catalog also features hundreds of full color illustrations throughout of not only the tokens but also related images that add to the historical interest and flavor of the pieces. Rounding out the book is a comprehensive index of merchants that will help collectors to quickly identify mavericks. In addition to Virginia Tokens, David E. Schenkman has authored seven other token catalogs including Merchant Tokens of Washington, D.C., Maryland Merchant Tokens, and in 2009 West Virginia Merchant Tokens, all of which have become standard works. Schenkman has been a prolific writer throughout his numismatic career, serving as editor of the Token and Medal Society’s TAMS Journal from 1982 to 2010, a task that included editing all the books published by that organization during that time. The second edition of Virginia Tokens continues in this fine tradition of ground-breaking research and will no doubt become an influential work on merchant tokens for years to come. The catalog is scheduled to be available for sale at the Virginia Numismatic Association’s 57th Convention & Coin Show to be held September 25th through the 27th, 2015 at the Fredericksburg Expo & Conference Center, 2371 Carl D. Silver Parkway, Fredericksburg, VA 22401. The book is priced at $75 with a discount for VNA members. 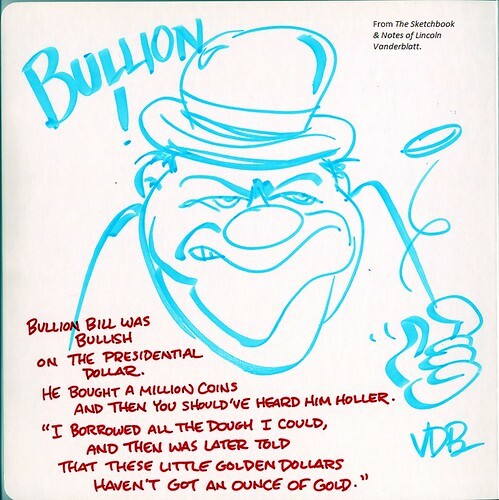 For more information on the Convention and book ordering, please contact the Virginia Numismatic Association or visit VNA’s website at www.vnaonline.org . I am always excited to find a new work that combines two of my passions, classical music and numismatics. R. Kevin Paul (with Alan Glasser) has produced a comprehensive guide to music related world coins, featuring 122 composers from 62 different countries. The book is organized in four categories, sorted by composer last name, country, year, and metal type. The composer section also includes an image of the composer, as well as a brief summary of their compositions by genre. This guide is a clear, definitive book on this often overlooked collecting area which interests many in our hobby today. It also comes at a time when collecting these coins in most metal types is still affordable, and an attractive introduction to numismatics for classical music lovers everywhere. I heartily recommend it. 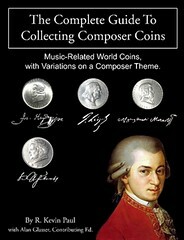 There is also an interactive website that gives current updates on the collecting of composer coins. 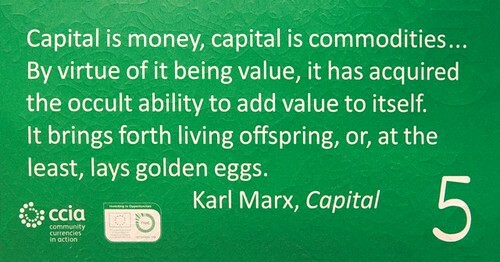 The book is available online at www.ComposerCoins.com. 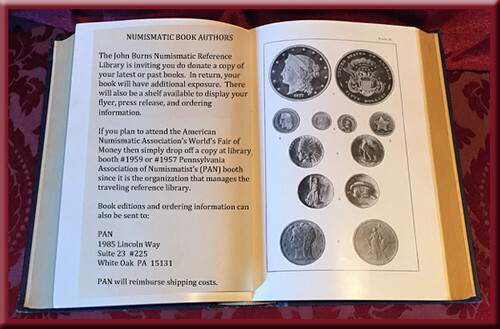 The Harry W. Bass Jr. Library at the American Numismatic Society has a dozen or so volumes that qualify as a miniature books. The smallest by far is by the Japanese artisan bookmaker Asao Hoshino. 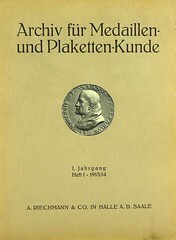 Measuring less than an inch square, Old Coins of the World (1977) has a black leather cover with gilt lettering and edging. 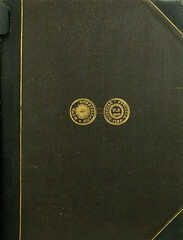 Only 250 books were produced and you can see the number 188 embossed on the cover of the ANS copy. The bulk of the 192-page volume consists of small black and white illustrations of historical coins with captions in Japanese and English. For reasons that are unclear to me, miniature books seem to have been particularly popular in Hungary. Two small hardbound volumes with well-struck silver plaquettes on their covers are the highlight of these Hungarian titles. These little books were printed to mark the 250th anniversary of the mining officers’ training school at Selmecbánya, and use medals and plaquettes to chronicle its history. Perhaps the most useful of the modern miniatures in terms of actual content is Történelmünk penzeken by István Gedai, which was published in Budapest in 1975. Most of the modern American miniatures are cheaply produced novelties, but the Hillside Press of Tilton, New Hampshire, published some wonderfully-made miniature books in the 1960s and 1970s. 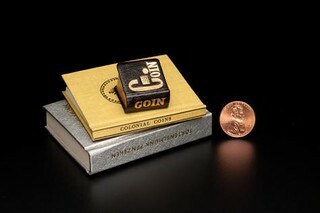 The diminutive Colonial Coins (1974) was printed in 6 point Bulmer Roman type that was set by hand. 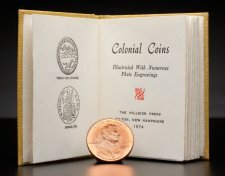 The text by F. E. Irwin gives a very brief history of the coinage of British North America and is illustrated with well-cut engravings throughout. "Sigel was prolific, and among his best-known signed Civil War tokens were cent-sized coppers hailing a cousin, the 1848 German democratic refugee General Franz Sigel as 'Hero of Pea Ridge.' That was an epic battle in the Western Department whose pivotal importance was muted by its trivial-sounding name." Actually, Franz Sigel was the eldest brother of the engraver Emil Sigel. The four Sigel brothers all came to the U.S. and, except for Emil, served in the Union Army during the Civil War. My paper on the Sigel family and the "Hero of Pea Ridge" Civil War token, which details all this, appeared in The Civil War Token Journal, Vol. 38, No. 2 (Summer 2004), pp. 3-10. This paper was awarded the CWTS first place literary award for 2004. Incidentally, my great-great-granduncle Richard Montgomery Hubbell fought at the Battle of Pea Ridge, but on the Confederate side. He had been a newspaperman and was in charge of printing the newspaper for the troops at the time of the battle. He gave it the name "Battle of Elkhorn Tavern" after a local tavern at the site, and this became the name the Confederates used for the battle. I have a copy of Hubbell's memoirs in which he describes all this. My point here isn't major, but given the long continuing confusion about the relationship between Franz and Emil Sigel I hate to see the error reinforced in this important new publication. Since I haven't seen the actual book yet, I don't know whether the cousin designation appeared in it or just in the review. I just wanted to take this opportunity to join the many others who have saluted your unwavering dedication and devotion to the publication of The E-Sylum over the past (nearly) two decades. While I am an old man now and have more or less lost my enthusiasm for numismatics (but not the literature), I know from first-hand experience how difficult publishing a periodical on a timely basis (weekly, for crying out loud!!!) can be. It might be one thing to emit a stream of drivel regularly, but to read, edit and publish a scholarly journal while rarely missing a deadline, is a feat few can even imagine. Nearly thirty-five years ago, I attempted my own publishing venture, intending to issue an 8 to 12-page newsletter on a bi-monthly basis. Needless to say, more numbers missed their deadline than achieved it. The problem wasn't material; Lord knows I had many prominent and knowledgeable readers who provided a plethora (thank you, Howard) of numismatic information, insights, opinions, etc. Rather, the frequent delays were due almost exclusively to my inability to "find the time." You, on the other hand, not only find the time, you find a LOT of time as evidenced by the amazing volume of topics and articles in each issue of the finest journal of its type in the world. I salute you, thank you, and wish you all continued success. I look forward to every new issue. Many kudos!!! Thanks. 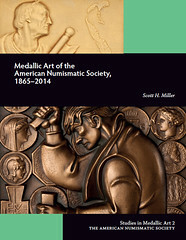 It's a pleasure to work on this every week - numismatic literature and research is a very rewarding hobby. It's a lot of cut and paste and computer magic; thankfully HTML does all the layout for me and I never have to worry about fitting a certain number of pages or running out of room. Publishing is far easier today than it was back in the day of print. It does take 8-10 hours or more a week to get each issue out, but it's so much fun I hardly notice some days. Will The Real David Rittenhouse Please Stand Up? Regarding the topic "All Things Rittenhouse" to be presented during the ANA Convention, I found one bit of trivia that will likely be omitted from the presentation. There are seemingly two actors in recent years named David Rittenhouse. I don't know whether these are real names or stage names, but both persons must be aware of its famous ancestry. It's possible that these David Rittenhouses are the same person, but there are two clearly separate entries in the Internet Movie Database. Maybe it's the photo, but the faces of the Presidents look awful to me - in isolation one might not even recognize the images as being from Mt. Rushmore. To me, it's an ugly looking coin. It's not just you: Rushmore apparently features Henry Gibson, Emma Thompson, Dr. Martin Luther King, and Jeff Goldblum. It makes a nice change. I'm attaching a sketch that Lincoln Vanderblatt dashed off a few years ago. The recent E-Sylum commentary on "gold dollars" vs. "golden dollars" made me think of it, and I dug it out of the archives. Please help the humble reader? See 30 coin dealers on Sunday morning in the Plaza Mayor of Madrid — and not see a single slab. Here you are welcome touch the coins, many of which are not in any 2x2 or flip, but laid out in open air coin cabinet compartments. The plastic entombment of coins is little known here and not highly regarded. Cop a feel of the coins you like, it's no problem. People here like to have a good look at the edges too. Unc coins you can hold just by the edges. EF and below, few dealers would be upset if you fondled the piece in your fingers. I keep my fingers strictly on the edges. I also use one of my business cards to flick the coin up out of its compartment to hold it, rather that fumbling around grabbing at the coin with thumb and forefinger as do some collectors. I understand there is a USA 3rd party grading firm branch in Paris — but Paris is a long way from here. The proposed change to the German law on Protection of Cultural Property is a huge threat to coin collecting in the United States--it affects everyone. No ancient coin worth $110 or more--and that's the vast majority of them--will be able to be sold in Germany unless its provenance can be traced back at least 20 years. How many can do that? And the burden of proof is on the collector or dealer. Germany is now one of the two main markets for ancient coins in Europe; I have this year paid a German dealer more than $110 for an ancient coin, and hope to buy many more. Don't collect ancient coins? Don't worry, they're coming after you too. Here the limit is a generous $2,750 for everything of cultural interest to Germans. Virtually every lot in the upcoming ANA auctions will sell for more than this. And "cultural property" includes rare books, coin cabinets and other furniture, paper money, documents, stamps, ethnographic material, musical instruments, etc., etc.,--everything over 50 years old. If in any doubt, promote Ursula's petition anyway. It requires 120,000 signatures in little over a month for the German government even to take notice of it. Unfortunately, the explanation is in German first, but if you keep going, it appears in English. Most likely you all know the story of the Jew Mayer Amschel Rothschild who opened a coin shop in the ghetto of Frankfurt around 1764 that supplied the European high nobility with numismatic rarities. His descendants were collectors themselves. 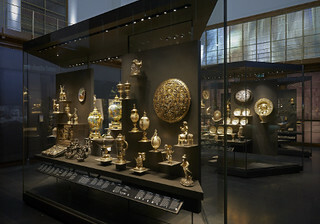 A part of the collection of Ferdinand, Freiherr von Rothschild (1839-1898), is currently on display in a new permanent exhibition in the British Museum. Ferdinand de Rothschild was born in Vienna. He had relatives throughout Europe and became an elected member of the British Parliament. Such an extent of urbanity aroused suspicion among the nationalists of the 19th century. Unsurprisingly, the Rothschild dynasty became the target of many a conspiracy theory and anti-Semitic hate campaign. Nowadays, Ferdinand de Rothschild would not have to defend himself for his faith. Nowadays, he would have to explain why he exported national cultural property – and I am sure he did not have an export license. Just take the reliquary to house the thorn of Christ’s Crown of Thorns, created for Duke of Berry in the 1390s. Or think of the Cellini Bell of Wenzel Jamnitzer from Nuremberg for which he took living animals as silver molds (today, this would spark off a riot and cause many a petition, animal rights activists are much better organized than collectors!). Of course, those objects are not discussed anymore, because the descendants of the Rothschild dynasty have donated them to the British people, via the British Museum. Now, they are English cultural heritage which, of course, can no longer be exported. All those national issues seem unreal to me when I see from which countries the people come who support the petition against the new German law on the Protection of Cultural Heritage. Not only Germans are signing, but collectors from all European states, from the United States, from Canada and further afar. Collectors from Albania, Argentina, Bangladesh, Brazil, Cambodia, Chile, China, Columbia, Ecuador, Egypt, India, Iran, Lebanon, Malaysia, Mexico, Morocco, Pakistan, the Philippines, Russia, Saudi Arabia, Singapore, South-Africa, Trinidad, Turkey, the Ukraine, Uruguay, Vanuatu, Venezuela, and many, many more countries are supporting the German collectors in their fight against a nationalization of the art trade. After all, the collectors’ world is still an international one, and the collectors’ horizon reaches far beyond their own, national culture. It is hardly surprising that collectors make the ideal scapegoats when it comes to blaming somebody for destroying cultural heritage. It would be too embarrassing for the representatives of the national states to speak it out that the lion share of their cultural heritage is destroyed due to their own neglect and indifference. A new amendment to the German Cultural property and Heritage Protection Law looks set to have extremely negative repercussions for collectors worldwide. 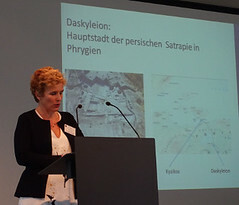 The proposed changes to the law, put forward by German Minister of Culture Monika Grütters, will affect anyone specialising in traditional collecting fields, such as coins, stamps and books. In basic terms, it means that any owner of what is deemed 'cultural goods' with a value of 2,500 Euros will now have to provide absolute proof of the the item's provenance for the previous 20 years. In the case of items that are deemed 'of archaeological value', the same is true to the value of just 100 Euros. I don't trade in Germany, why should I care? Collectors all over the world need to take notice of this proposal. If it passes, it means that it will severely restrict trade in Germany, which will inevitably have a detrimental effect on prices and values across the entire market. Law is law, what can I do? This is one of those rare occasions where the voice of those directly affected can make a difference. The proposed amendment openly calls for 'comment and contribution', meaning that it is not yet set in stone and we can have an influence on the amendment's future. A petition has been created which you can sign by following this link. At A H Baldwin & Sons we are actively encouraging our valued customers and friends to sign, so that we can continue to preserve the traditions and time-honoured culture of not just numismatics but collecting in all its guises. As always, we continue to appreciate your support. Sens. John McCain and Mike Enzi want to save billions of dollars by replacing paper dollar bills with coins. The two Republicans on Wednesday unveiled the proposal as part of legislation aimed at reducing waste in the federal government. According to the two lawmakers, ditching the dollar bill for the "more sustainable and efficient dollar coin" would generate savings ranging from $4.4 billion up to $13.8 billion. The savings would come by eliminating the need for the Treasury to spend more on printing money than the actual value of the dollar. "I hear from Arizonans every day who are tired of seeing their limited tax dollars spent on wasteful government programs," said McCain of Arizona. "By reforming and modernizing America's outdated currency system, and moving forward with commonsense good government practices, this bill would enable our country to reduce unnecessary bureaucratic waste and generate billions in taxpayer savings." On 27 June 2015, Dr. Ute Wartenberg, Executive Director, received the Honorary Medal of the Gesellschaft für International Geldgeschichte (GIG). During a ceremony at the Historical Museum in Frankfurt, Christian Stoess, President of the GIG, awarded Dr. Wartenberg the medal. In a tribute to the honoree, Dr. Bernhard Weisser, Director of the Coin Cabinet in Berlin and long-time friend, spoke about Dr. Wartenberg’s career and life. Roger Burdette's articles on gold dollars are excellent. 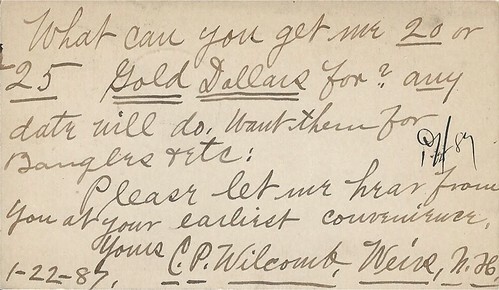 Here is another Chapman Brothers postal card on gold dollars our readers will find of interest especially since it was sent by Charles Presby Wilcomb, an important pioneer in American Museums and specialist in Indian artifacts. WILCOMB, CHARLES PRESBY Charles Presby Wilcomb (1865-1915), son of Frank and Eliza Saltmarsh Wilcomb, at The Weirs, Lake Village, New Hampshire. In 1884 he opened a general store in Laconia that also sold antiques and curiosities. Because of the unusual inventory the locals called his store Wilcomb’s Museum. In 1885 he self-published a book Indian Relics. Also in 1885 he wrote to the Chapman Brothers, Samuel Hudson and Henry Jr., for gold dollars to be used as bangles, etc. Back of the Postal Card ... with the message : "What can you get me 20 or 25 Gold Dollars for? Any date will do. Want them for Bangles, &tc. Please let me hear from you at your earliest convenience. Yours, C. P. Wilcomb, Weirs, N.H."
The following year he published the Museum Bulletin: Devoted to the Interest Collectors of All Classes and the Public in General, from May 1886- February 1887 (not listed in Remy Bourne). 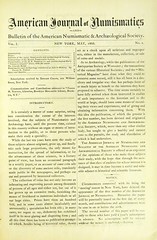 In the Curiosity World, Volume 2, Number 2, September 1887, Wilcomb announced he transferred the magazine to John M. Hubbard publisher of Curiosity World as the new publisher. After closing the magazine he started out on a bicycle from “The Weirs” Lake Village, New Hampshire to Denver, Colorado. By 1888 he joined his eldest brother Edgar in Visalia, California, where he opened another general store very similar to the one in Laconia. In 1889 he opened the Visalia Museum of Curiosities with a business partner Captain Nanscawen. In 1892 he donated 3,000 objects to the Golden Gate State Park, San Francisco, California, that included coins, minerals, butterflies, birds eggs, etc. He was appointed the first curator of the Golden Gate Park Memorial Museum (later on renamed M. H. de Young Museum). In 1893 he married Addie Nichols. They lived in Visalia where he became the assistant postmaster. In 1900 he traveled to Europe to study museums in order to keep abreast on museological administration, collection development, storage, exhibitions-period room designs, and organization. It was at this time that Wilcomb is attributed with forming the earliest known period room in an American Museum in his construction or rather a reconstruction of an "Early American Colonial Kitchen". It is also thought he did this earlier while in New Hampshire, regardless he was an innovator in Museum exhibits of anthropological assemblages. The Park commissioners, however, did not like Wilcomb’s Indian artifact collection, which was at that time considered by many experts to be of great value. The Smithsonian Museum has photographs in 18 negatives in glass taken circa 1900 of his Indian basket collection. The Park commissioners demanded he remove the 420 rare Indian basketry artifacts, which he then sold to Robert Calvin Hall of Pittsburg, Pennsylvania in 1905. That year he resigned from the Museum and moved to Aspinwall, Pennsylvania as the new curator of Hall’s Museum of Anthropology. In 1906 Wilcomb and Hall joined the newly formed American Associations of Museum. In 1907 Frank K. Mott, Mayor of Oakland California hired Wilcomb to be the first curator of the Oakland Museum. 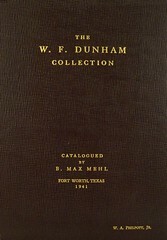 In 1908 photographs of Wilcomb and his Indian basketry collection were published in The Index, Volume 18, No. 9, February 29 (1908) : 6. The Museum opened to the public October 21, 1910. On June 23, 1915 he died from peritonitis from a ruptured appendix. Perhaps you E-Sylum readers are smarter than a NOVA kid. The question: Having shown them encased postage stamps they asked whether letters were delivered by postmen across the Mason-Dixon divide between North and South during the Civil War. Eric fielded this question with an answer that sounded right, but the way we all looked at one another, the kids probably caught us crossing our fingers behind our backs. For really great stumpers like that I think next time we should award an entire uncut sheet of auction bucks, a real collectible! So what would be your answer? I seem to recall that Benjamin Franklin’s Copley Medal may be in a Philadelphia institution, but I couldn’t track down a reference. Nevertheless, I thought folks might be interested in seeing a December 1753 article from the Gentleman’s Magazine reporting Franklin’s award, complete with an engraving of the medal with his name on it. 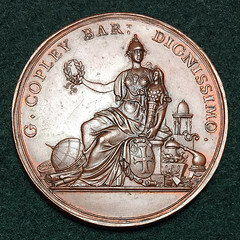 Also, note that the 1905 Mendeleev medal pictured in last week’s E-Sylum is a later variety of the medal, so I’ve attached photos of a copper specimen of the original 18th century version. My son in DC took us recently to the Smithsonian American Art Museum. Hidden in a corner on the third floor are 12 drawers of American medals. On line, however, is the collection of 300+ medals. 2 7/8 in. (7.3 cm) diam. 2 7/8 in. (7.4 cm) diam. 2 1/2 in. (6.4 cm) diam. In the early nineteenth century, the Southwest region of North America was part of the Viceroyalty of New Spain, which administered a huge swath of land including that which now constitutes the state of Texas. On March 29, 1817, the Acting Governor Manuel Pardo posted notice that "our neighbor Don Manuel Barrera having petitioned to this government the milling of fifteen hundred pesos in total containing his name and surname; this government has accepted this individual's solicitation to mill fifteen hundred pesos in total, with a value of half a real for each." This order represents the first such authorization to produce Spanish colonial coinage in what is now the United States. 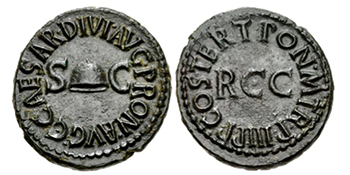 With a peso being the equivalent of an eight reales silver coin, this would represent a production order of 24,000 such coins, though this number has been in dispute, with some sources indicating that only 8,000 jolas were authorized. Barrera, a local merchant and jeweler in San Antonio de Bexar, began striking the half real pieces using hand cut dies on crudely fashioned copper planchets with angled edges. Several designs were employed but none were elaborate. One version bears the legend M. BARRERA, the denomination 1/2 and AD1817, and another, much more simple that simply reads M.B. and the date 1817. On May 27, 1817, Acting Governor Pardo relinquished his command to Antonio Maria Martinez who served as Governor of New Spain until August 17, 1822. In December 1818, Martinez issued a recall notice for the Barrera jolas in favor of a new issue to be produced by Jose Antonio de la Garza. The coins issued by de la Garza were the much better known J.A.G. 1818 jolas, which appear to have been designed in imitation of the simpler Barrera jolas. For decades, the 1817 jolas were more mythical and while documentary evidence for their existence had been known, the coins themselves were largely unknown. In the early 1960s, scattered reports of metal detector finds surfaced from time to time hinting at the 1817 dated coins. It was not until James Bevill's book The Paper Republic came out in 2009 were the coins first widely published and made known to a broader numismatic audience and later expanded in the May 2011 edition of The Numismatist by Bevill and Alvin Stern. The story of the 1817 and 1818 jolas can now be pieced together with a lot more accuracy, though much research no doubt remains. Today the Texas jolas have begun to shed their cloak of mystery and reveal the fascinating story behind these historic piece of early American history. 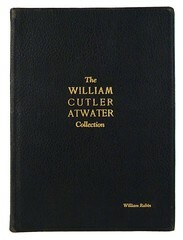 Eminently collectible in any grade, this is a series awaiting further study and appreciation. 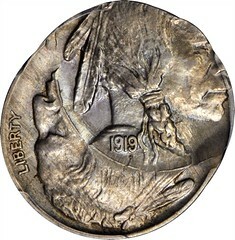 A visually dramatic and consequently extremely rare Mint error in a Buffalo nickel. The second strike is off center at 1 o'clock, but it is located at approximately the 6 o'clock position relative to the first impression. The result is that both sides display partial designs that are nearly upside down relative to each other. The only date visible is that from the second strike, and all design elements that are present are sharply defined and clear. Evenly toned in soft pearl gray, flickers of baby blue iridescence are also evident in isolated areas as the surfaces rotate under a light. A lovely piece, and a coin that is sure to catch the eye of advanced Buffalo nickel collectors and error specialists alike. All examples of these die trials are of the highest rarity. As one of the few tangible relics of this ephemeral Gold Rush company, it is of prime historical interest for the dedicated student of the California Gold Rush. Lot 10301: 1849 Pacific Company Pattern $2.50. The issues of the Pacific Company have baffled and intrigued scholars for decades. 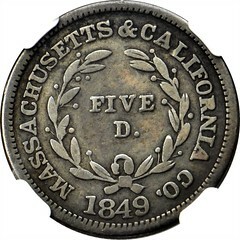 It is thought that the "Pacific Company" organized by Boston merchant John W. Cartwright in January of 1849 might be the leading contender as issuers of a series of enigmatic coins all dated 1849. After arriving in San Francisco and then Benicia in September, the company dissolved scarcely one month later. 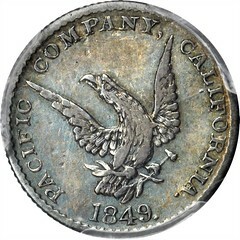 Some recent research has shown that the dies for these coins may have been prepared in the East and arrived to California with the members of the company. When the Pacific Company disbanded shortly after arriving, the dies appear to have come into the possession of assaying firm Broderick & Kohler in San Francisco, who then used the dies to produce a series of gold coins at relatively low purity for general circulation. The half eagles and eagles produced in gold were shown by U. S. Mint assays to have an intrinsic value of $4.48 and a surprisingly low $7.76, respectively, and were promptly rejected in circulation except at a steep discount. Most ended up in the melting pot and now only a mere handful of gold coins and a series of silver and base metal patterns remain. While a gold dollar has been discovered, so far no gold $2.50 pieces are known and quite possibly were not struck. When we (Stack's) offered the Roper Collection silver $2.50 pattern back in 1983 it was noted that the piece was overstruck on a dime. While it is most likely that these silver patterns were struck on dimes or similar sized foreign coin (a possibility that makes sense if the pieces were struck in the West), so far the evidence has proven to be inconclusive. A first class rarity by any measure, the pedigree of the present specimen to the legendary Garrett Collection only adds to its historic importance and will no doubt elicit considerable attention to Gold Rush specialists. Riksbank, the central bank of Sweden, announced the bank has launched the largest banknote and coin changeover in the country's history. The first new banknotes will be issued in October, the bank announced on its website. The bank aims to prevent forgery by changing the banknotes and coins with new designs that include new security measures. Riksbank will also be initiating a major information campaign to increase people's awareness before releasing the new banknotes and coins. The information campaign will include the launch of an app with a banknote game and support for the visually impaired, as well as exhibitions of the new banknotes at six different locations in Sweden associated with the personalities depicted on the banknotes. "One-quarter of Sweden's population is still unaware that Sweden will be getting new banknotes and coins. We will be using several different channels to reach as many people as possible. The app will make it possible to have information easily at hand and will provide assistance for the visually impaired. A banknote game in the app offers a different and fun way to learn important dates in the changeover," said Christina Wejshammar, head of the bank's Cash and Payment Systems Department. 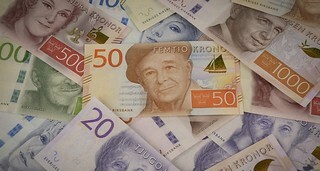 There will be pictures of famous Swedish artists and writers on the banknotes and coins along with nature motifs. New two-krona coins will be launched and five-krona coins will be changed. Other coins will still show current King Carl XVI Gustaf. Sweden decided to replace its bronze 2 and 5 krona coins with silver ones. Meanwhile, the 20 krona bill, which still circulates in the market and features the portrait of famous Swedish writer Selma Lagerlöf, will be replaced by a one that will carry the portrait of country's prominent children's book writer Astrid Lindgren. The previous motifs on the 50 krona bill will be replaced by a portrait of famous Swedish musician Evert Taube and the motifs on the 100 krona bill will be replaced by world-renowned Swedish-born film actress Greta Garbo. It was also announced that a portrait of famous Swedish director Ingmar Bergman will be featured on the 200 krona bill that will be issued for the first time. The look of the biggest Swedish bills of 500 and 1000 krona in circulation will completely change as well. The new 500 krona bills will feature a portrait of Swedish opera singer Birgit Nilsson, while a portrait of Swedish diplomat, author and former United Nations Secretary-General Dag Hammarskjöld will be printed on the new 1000 krona bills. As the undisputed leading auctioneer of rare coins and banknotes in Southeast Asia, our auction will be an event you will not want to miss. Included in the sale will be over 1,600 lots of the most desirable numismatic material available anywhere in the world today. Much of the material up for bid will be of museum quality. However, you need not be a curator to participate in this extraordinary event! 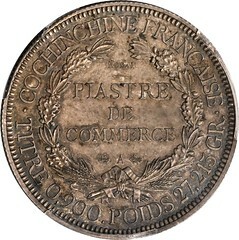 Within the first hour of the auction, lot 51045 will cross the block, an extremely rare 1879-A French Cochin China silver Piastre Essai, certified as SP-63+ by PCGS. This impressive coin features one of the earliest known uses of the Art Nouveau style on coinage. Adding to its desirability, the surfaces exhibit a wonderful panorama of deep color tone. Shortly afterward, Lot 51182 will offer an undated (1864) Thailand ½ Baht struck in gold and graded MS-64 by NGC. 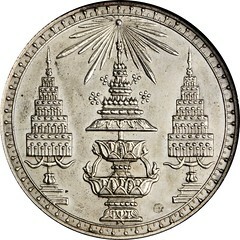 The piece is part of an extremely in-depth offering of Thai coinage, including the most comprehensive assemblage of 1868 machine struck patterns ever to be offered in a single sale! 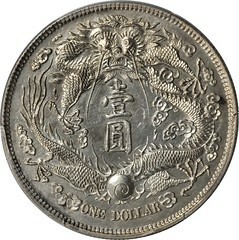 Lot 52024 will feature a Tientsin Mint Year-3 (1911) Long Whisker Dragon Pattern Dollar graded MS-61 by PCGS. It will be one of a number of late Empire issues to cross the auction block, and a coin sure to attract spirited bidding. Another 1911 dated coin from this same mint will be Lot 52033, a 50 Cent pattern with instantly recognizable specimen striking qualities, graded as SP-62 by PCGS. Lot 52091 will be a spectacular Year-3 (1914) Pattern Dollar signed by L. Giorgi and graded SP-62 by PCGS that will be of intense interest to the collectors of early Republic issues. Lot 52107 will offer a Year 12 (1923) Dragon & Peacock Pattern Dollar graded MS-64+ by PCGS, with exceptionally attractive peachy smoke colored tone. 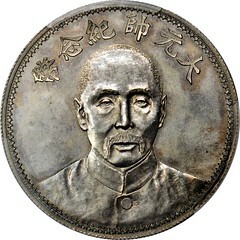 Yet another extremely rare Tiensten Mint pattern commemorative will be found in Lot 52165, a Year-17 (1928) Dollar depicting Governor Chang Tso Lin, graded SP-62 by PCGS. The wide selection of coins from Hupeh will include Lot 52252, an impressive Large Characters Year-30 (1904) Tael graded AU-58 by NGC, one of the few surviving examples of the issue. From Kiangnan, Lot 52279 will introduce a splendid Ornamental Edge ND (1898) 7 Mace 2 Candareens in MS-63, graded by NGC. Lot 52165 features a coin struck in every collector’s favorite denomination: 7 Mace 3 Candareens. The offered piece is an extremely rare circulation striking from Kwangtung and one of the very few surviving examples, graded EF-45 by NGC. And these are just the coinage highlights! An equally compelling array of banknotes awaits prospective bidders in Sessions “A” and “F”. The banknote sale will commence with Chinese material, starting with an impressive selection of Empire issues that includes many examples of the popular “Ming Note,” as well as pieces from the Qing Dynasty and Board of Revenue issues. The highlight of the sale will be an important Banque de L’Indo-Chine One Piastre, issued from the Canton-Shemeen branch and dated 1902. All notes from the branch are highly rare. The only other example we have handled from the Shemeen Branch was a Five Piastres specimen note (also dated 1902), that brought $57,500 in our December 2010 Hong Kong sale. The offered One Piastre banknote is a true prize for any collection, with the Maurice Kolsky reference describing the note as “Nearly unique, two or three known.” The note is also plated in the Standard Catalog of World Paper Money. An always popular Pick S2135r, Hupeh Government Mint 7 Mace, 2 Candareens will be offered in an impressive Very Fine state, displaying the intricate, large vertical format design in strong detail. Another large vertical format rarity crossing the block will be a rare 100,000 Cash Qing Dynasty note dated 1858. A pair of rare Hong Kong and Shanghai Banking Corporation notes on Chinese branches will be offered comprising an issued Five Dollar note from 1920 and a scarce specimen $100 design dated 1922. One of the last few lots to be sold will also be one of the most important, and sure to generate heated interest. This is a note we have not previously handled, a $10,000 from Malaya featuring a portrait vignette of King George VI, issued as a specimen. Republic era banknotes in the sale will include many rarities. Key Provincial Chinese banknote rarities are also featured and the sale finishes out with an impressive offering of Hong Kong currency, plus notes of the British Commonwealth. In addition to the live floor bidding for each session, the auction will be fully supported with live Internet bidding enabling participation from anywhere in the world. Stack’s Bowers & Ponterio also offers an extensive schedule for pre-viewing lots. Inspection begins at our Irvine, California offices from August 3rd thru the 10th, with viewing commencing in Hong Kong on August 18th. Be sure to check our website, StacksBowers.com, for the specific days and times of the various auction sessions. And of course no announcement would be complete without a reminder that when you are ready to sell, Stack’s Bowers and Ponterio is your source for liquidation. We offer professional handling of your collection, with a proven track record of accomplished sales. Currently, we are accepting consignments for our November Baltimore, December Hong Kong, and January NYINC sales, and we would be delighted to hear from you. We can be reached at 949-253-0916 or via email at info@StacksBowers.com. 50106 - CHINA--FOREIGN BANKS. Banque de L'Indo-Chine. 1 Dollar, 15.1.1902. P-S436. Fine-Very Fine. 52024 - CHINA. 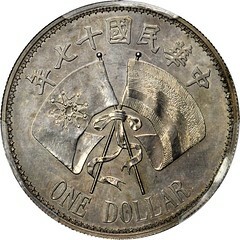 Long Whisker Dragon Pattern Dollar, Year 3 (1911). Tientsin Mint. PCGS MS-61 Secure Holder. 52165 - CHINA. Pattern Dollar, Year 17 (1928). Tientsin Mint. PCGS SP-62 Secure Holder. 51143 - THAILAND PATTERNS. 4 Baht Struck in Copper-Nickel with Reeded Edge & Medal Alignment, ND (1868). Rama V, Phra Maha Chulalonkorn (1868-1910). NGC PROOF-64. 53001 - CHINA. 100 Yuan Pattern, 1982. Panda Series. NGC PROOF-65 ULTRA CAMEO. 52002 - CHINA. 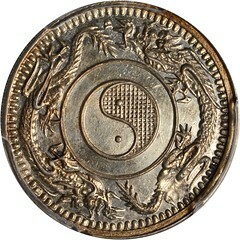 Kwan Ping Trade Coinage "Chinese-Foreign Circulating Coin". Pattern 1 Mace, ND (ca. 1858). PCGS SP-62+ Secure Holder. 51045 - FRENCH COCHIN CHINA. Piastre Essai, 1879-A. PCGS SP-63+ Secure Holder. The highlight of the sale is an important Banque de L’Indo-Chine One Piastre that is from the Canton-Shemeen branch dated 1902. This branch is extremely rare in any denomination; we have only ever offered a single other in our past auctions, a Five Piastres specimen note, also of the 1902 date, that brought $57,500 in our December 2010 Hong Kong sale. This issued One Piastre is a true prize for any collection, with the Maurice Kolsky reference describing the note as “Nearly unique, two or three known.” The note is also plated in the Standard Catalog of World Paper Money. An always popular Pick S2135r, Hupeh Government Mint 7 Mace, 2 Candareens is offered in an impressive Very Fine state, showing the intricate large vertical format design in strong detail. Another large vertical format rarity to be offered is a 100,000 Cash Ch’ing Dynasty piece dated 1858. A pair of rare Hong Kong and Shanghai Banking Corporation notes on Chinese branches comprise an issued Five Dollar note from 1920 and a scarce specimen $100 design dated 1922. One of the last few lots to be sold is also one of the most important and a piece we have not previously handled. This $10,000 specimen note from Malaya features a portrait vignette of King George VI and will certainly garner significant attention when it crosses the auction block. Lot 50001 - Ming Dynasty. 1 Kuan, ND (1368-1399). P-AA10. CMC Extremely Fine 40. Lot 50008 - Ch'ing Dynasty. 100,000 Cash, Yr. 8 (1858). P-A8b. PCGS Very Fine 30 Apparent. Lot 50010 - Board of Revenue. 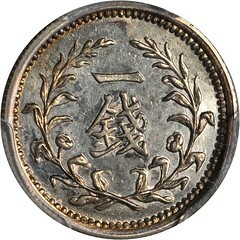 10 Taels, Yr. 4 (1854). P-A12b. CMC Very Fine 25. Lot 50014 - Ningpo Commercial Bank Limited. 5 Dollars, 22.1.1909. P-A61C. PMG Very Good 10. Lot 50016 - Commercial Bank of China. 5 Taels, 1.1.1920. P-A135a. PMG Choice Very Fine 35. Lot 50020 - Bank of China. 1 Dollar, 1.6.1912. P-25t. PMG Choice Fine 15 Net. Lot 50022 - Bank of China. 5 Dollars, 1.6.1913. P-31s. Specimen. PMG Choice Uncirculated 64 EPQ. Lot 50032 - Bank of China. 10 Yuan, 1939. P-81Cs. Specimen. PMG Choice Uncirculated 63 EPQ. Lot 50092 - Federal Reserve Bank of China. 100 Dollars, 1938. P-J58s. Specimen. PMG Gem Uncirculated 65 EPQ. Lot 50100 - Hong Kong & Shanghai Banking Corporation. 100 Dollars, 1.1.1922. P-S343. Specimen. PMG Choice Uncirculated 64. Lot 50102 - Hong Kong & Shanghai Banking Corporation. 5 Dollars, 1.1.1920. P-S382. PMG Choice Very Fine 35. Lot 50106 - Banque de L'Indo-Chine. 1 Dollar, 15.1.1902. P-S436. Fine-Very Fine. Lot 50112 - Kiang-Nan Yu-Ning Government Bank. 1 Dollar, 1.7.1907. P-S1180b. PMG Choice Very Fine 35 Net. Lot 50119 - Hupeh Government Mint. 7 Mace 2 Candareens, Yr. 25 (1899). P-S2135r. Remainder. PMG Very Fine 30. 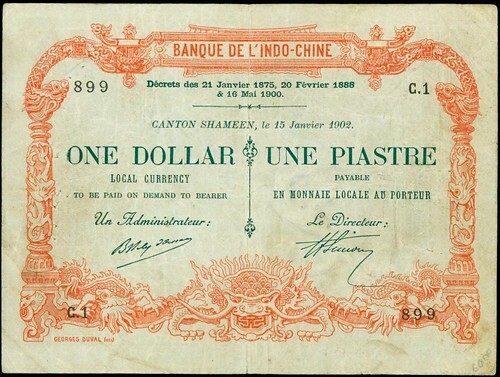 Lot 50153 - Banque de L'Indo-Chine. 50 Roupies, ND (1936). P-7s. Specimen. PCGS Superb Gem New 67 PPQ. Lot 50164 - Bank of Japan. 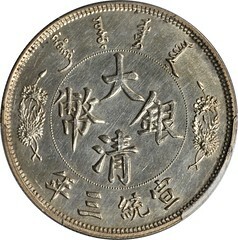 10 Yen, ND (1890). P-28. PMG Very Fine 25 Net. Lot 50190 - Board of Commissioners of Currency. 10,000 Dollars, ND (1942). P-17s. Specimen. PCGS About New 53 Apparent. A handful of other local currencies currently exist in the UK – in Totnes, Lewes, Stroud and, from 2012, Bristol. 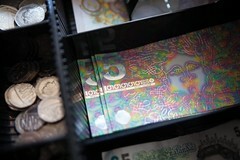 "It's a simple premise – [it's a] local currency that can only be used in independent local businesses," explains Charlie Waterhouse, creative director of This Ain’t Rock’n’Roll, the studio that designed the second series of the Brixton Pound notes in 2011 and oversaw the new Deller note. "You buy a coffee in an independent café and the money probably goes to the people who are serving you," Waterhouse adds. "You buy a coffee in a chain, and the money probably goes to City shareholders. It's a more virtuous circulation of cash." The Brixton Pound initiative was started by volunteers from the Transition Town Brixton community-led organisation. In TARR's redesign of the currency in 2011 – see our story here – the studio incorporated images of some of the areas most respected sons and daughters: David Bowie features on the B£10 note (above); Chicago Bulls basketball player, Luol Deng, on the regular B£5; and WWII spy, Violette Szabo, on the B£20. Len Garrison, the co-founder of the Black Cultural Archives appears on the B£1 note. According to the Brixton£, Deller's new design "adds a significant and provocative message that reflects our intention to raise the conversation of how we understand, use and value money in this time of economic instability and what we could aspire to in the future". "On two small sides of paper it provides an utterly compelling response to Austerity Kool-Aid," adds Waterhouse. "It simultaneously challenges and inspires, perfectly enunciating the positivity inherent in much of the grassroots response and resistance to the current economic situation." The new design also reflects some of the innovations that the Brixton Pound has brought in over the last few years, such as pay-by-text and contactless payment across the 300-odd independent businesses that take the currency. "The new Brixton Pound fiver drives home the simple fact that we can all make positive choices around our spending," adds Waterhouse. In your article on Alves Reis, you missed one very important thing he used his notes to purchase. He bought up stock shares in the Bank of Portugal in an effort to gain a controlling interest. (He came close, too.) The reason was because under Portuguese law ONLY the Bank of Portugal could bring charges of counterfeiting against someone. If he had controlling interest, he would have been in a position to stop any investigations into his "extra" banknotes. As a side note, a few months ago one of his notes did appear on eBay. 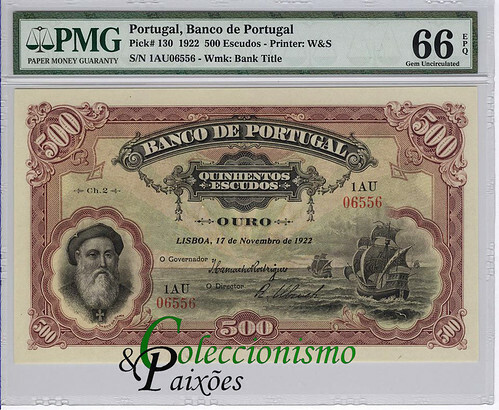 It was slabbed by PMG as a genuine Bank of Portugal note and not as an Reis copy. When Reis had his notes printed he had not completely worked out the bank's serial numbering system. According to information in Murray Bloom's book, Portugal never used a double vowel in the serial number prefix, and the prefix letters never went past AN. The note in the PMG holder had an AU prefix. I would have loved to have added the note to my collection, but with a grade Gem Uncirculated 66 and EPQ (Exceptional Paper Quality) and a price of $49,000 I had to pass. I would like to have one of his notes someday but after the copies were discovered the bank actively withdrew the notes from circulation so today even the genuine notes are not cheap. I'm glad Michael brought that up - that's my favorite part of the whole scheme. The guy was a genius. Birth, marriage and death, and generally in that order. They all require certificates of authenticity, which are available at the clerk-recorder’s office in the county of origin. But for a limited time only, people wanting copies of these vital documents from the Stanislaus County Clerk-Recorder’s office will be limited to just one of each. Seriously. Only recently did Lundrigan and other government officials around the state learn of the company’s closure and the headache it will cause. Hence, the one-per-family limit until either a new supplier can be found or the state Legislature amends the Health and Safety Code to allow security measures that don’t require the highly specialized Intaglio printing method. 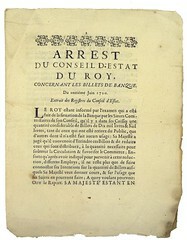 The printed borders are raised and obvious to the touch. 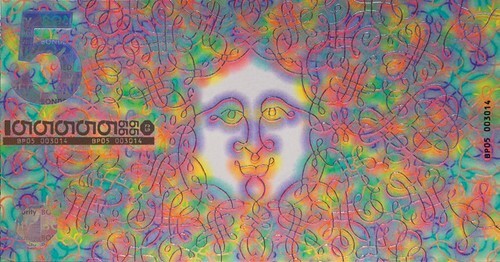 Each is – or was – produced individually on a hand-cranked press by Sekuworks in Cincinnati and sold to state agencies through distributors including Pacific Bancnote or Northern Bank Note. The Intaglio printing technique is mandated by California Health and Safety Code 103526.5, which dictates the security measures for birth, death and marriage certificates. The state also requires light-sensitive images, fluorescent numbering and matching bar codes, microprint lines, watermarks, fluorescent security threads and fibers and anything else the state registrar can think of to make it tough on counterfeiters to, well, counterfeit. New suppliers? If the only California-approved Intaglio printer in America is out of the business, and no domestic replacement can be found, distributors will look outside of the country to find an engraver and then that engraver must be licensed by the state. Getting supposedly secure documents from hacker-happy countries like China or Russia certainly doesn’t wow anyone here. Imagine conducting a search for an auction lot a year from now. 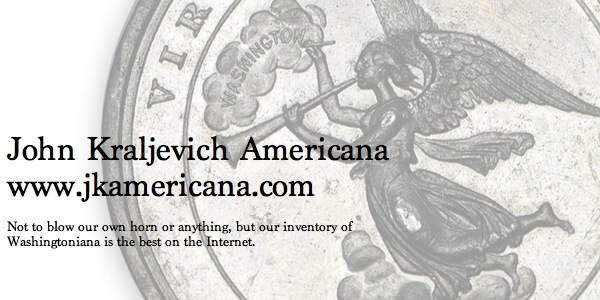 You go out to the Newman Numismatic Portal and have access to every American auction catalog ever printed. Until then, it's a search by hand through a library. I believe I have an example of every Bowers sale from 1972 through 1990. That takes up about five feet of shelf space. 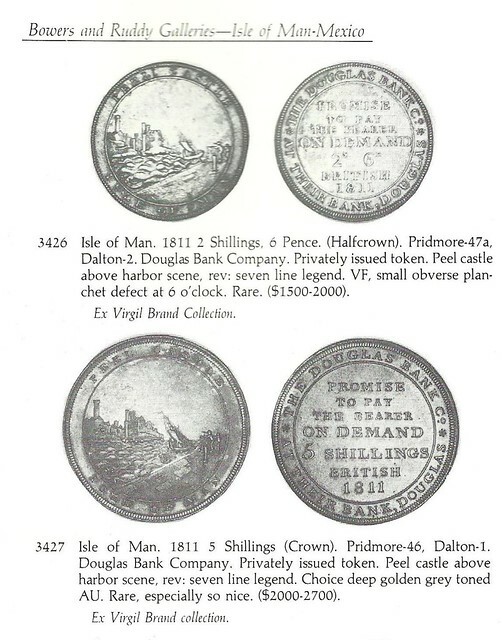 My review of Bowers catalogs last night did not turn up the Isle of Man coins. But wait, there's more! All my catalogs containing 1792 patterns are in another place and another ten feet of shelf space. The 1981 ANA sale catalog had a Birch Cent. It also had the Isle of Man coins. I am attaching a scan of page 340 from the catalog of "The William Sieck Collection" sold July 28 to August 1, 1981, as part to the ANA sale. Lot 3426 realized $850 and lot 3427 realized $1650. Thank you all very much indeed for this, I am truly grateful, as is the current owner of the coins. He acquired them from a lady in the Isle of Man whose husband was a collector of coins in the US, so it all fits nicely. Pete, I thank you again for your time and trouble, it is much appreciated. It seems there are no limits to which readers of The E-Sylum will try to help each other solving puzzles! Thanks! This is a great illustration of the state of numismatic research today. While a lot of information is indeed available online, much if it is not, and most of what is available is scattered among various web sites or hidden behind paywalls, leaving researchers on their own to poke behind every available rock in search of their answer. What we're attempting to do with the Newman Numismatic Portal is build an online repository that archives and enables search and browsing across the wide spectrum of numismatic publications, from classic books, periodicals and auction catalogs to today's Internet-based auctions and publications. That comprehensive repository won't be complete in a year, and may in fact never become fully complete. But page by page we're already adding material and are looking forward to demoing some of the content and features at the upcoming NBS Symposium at the ANA World's Fair of Money later this month. 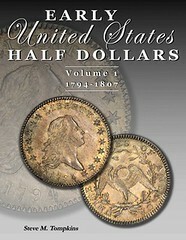 The second publication, however, is a "horse of a different color": entitled A Monograph of the Silver Dollar, Good and Bad and also published in 1845, it is a study of all of the different types of silver coins presented as deposits at the New Orleans Mint, with obverse and reverse images of each coin type. As you might expect, a lot of counterfeit coins were deposited at the Mint, and the book has images of each one. 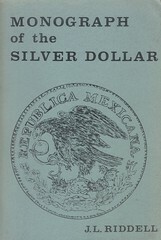 If you are interested in seeing which counterfeit Mexican dollars or Bust half dollars were actually in circulation in the mid-19th century, this is the book for you. The book's pages aren't numbered, but it has images of 512 coins plus introductory text, so it must have about 200 pages. While I've only been watching the numismatic book auctions for about a decade, I don't recall seeing an original copy, nor had I heard of a reprint. Fortunately, there is a digital copy available. 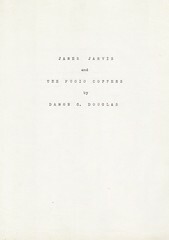 Imagine, then, my surprise, when I saw a listing for a 1969 reprint in David Sklow's October auction! The book was identified as one of a limited edition of 550 paperback copies from Mexico. I wasted no time in submitting my bid and I was fortunate enough to obtain the book. When I received it, I was intrigued to see that it was copy #411 of a 550-copy facsimile edition published by the Numismatic Society of Mexico in 1969. I feel as if I've unearthed a bit of buried treasure: I certainly never expected to acquire an original, but I now have a copy of a reprint that I never expected to own! Of course, as soon as I saw the auction listing, I checked the ANA and ANS library catalogs and learned that each library has, in addition to copies of the original in their rare book collections, copies of the reprint. In fact, the ANA library has three copies, each available to be lent. So, it's not as if the reprint were completely unknown, but it's certainly not exactly available in the marketplace, either. I'm hoping that one or more of my fellow E-Sylum subscribers can shed some light on how this edition came to be published and why it doesn't seem to be more available. Sorry for the delay – I just joined your group this year — but I can answer that question posed in the Dec. 1 2013 issue: It was me! I did that reprint — during the first half of 1969 on Ft. Lee, Petersburg, Virginia. With the help of a moonlighting printer on the Air Force station there, we produced the book with paper and supplies I bought, working at night on the small lithographic press. Camera work was done on the pages of the dismantled original book, then printing using aluminium plates for the short 550 press run. I had the books bound in Richmond. I then stamped individual serial numbers in the books. I shipped the books to U.S. headquarters of the Association in California. I was a 25-year old USAF Captain at the time and my dad, Ed Beals, in our hometown of San Diego, was the contact point between the Numismatic Society of Mexico and my nocturnal printing effort. I do not recall any details regarding the reasoning behind the reprinting other than a desire by the group to make the information more available. Interesting that the original book uses what we might call rubbings to illustrate the coins as it pre-dates photography by a decade or so. And, apparently, ole Mr. Riddell did not want to pay an illustrator to create line art for all those coins. The USAF station, a branch of NORAD no longer exists there. Oh, a personal note: I started collecting at age 16 and got my dad started in collecting coins, not the other way around! We were both active in the hobby until I left for the Air Force in mid-1966. There are a few copies here in Spain with the Segovia Mint Amigos group and a few more in California. When any of you visit Spain, I am sure a kind donation to the group would get you one of the copies. And I will take you to the mint built here in 1583! If The E-Sylum had a prize for the “Contribution of the Year,” surely Gary Beals would win it. Not only does he reprint a then-124 year-old book, but, rivaling the producers of the 1913 Liberty nickels, he does it clandestinely! All I can say is, from one formerly young Air Force captain to another: “My hat’s off to you!” What a great story. I’m really going to treasure my copy now. This is a saga about an unknown sculptor named Pickett. 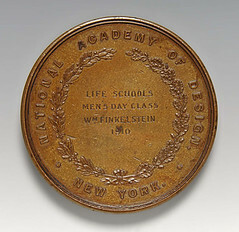 Prior to 1970 I cataloged an oval medal for the Lincoln National Life Insurance Company made by Medallic Art Company. It bore a stunning high-relief portrait of Abraham Lincoln. That is the oval medal I am holding in the picture adjacent. 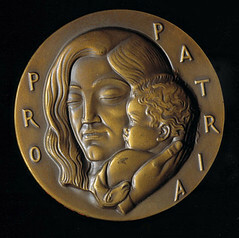 Company policy requires identity of the sculptor of any medal they strike. The piece is signed “Pickett” and the date 1873. No first name. I hit the art reference books. Everyone called it the “Pickett Head” but nowhere could I find a full name. One day in August 1972 I walked the five blocks to the New York Public Library from MACO's NYC office and perused the card file in the Art Department. I took a chance and searched for “Pickett.” I found a reference to a Byron M. Pickett in an 1873 auction catalog. I called for the catalog. Bless some cataloger at the New York Public Library years ago who made reference to two artists in this slim 3-page catalog. 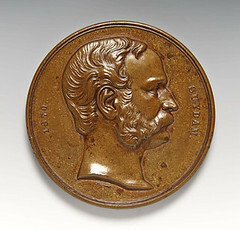 Two lots by Pickett, one of a Lincoln portrait relief were among the 24 lots listed. 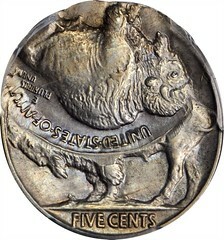 Could this be the obscure Pickett that the Lincoln Medallic Art had recently replicated? The creator of the Pickett Head? The Lincoln National Life Insurance Company had built a collection of all things Lincoln beginning in 1928, and moved this growing collection to its own building in 1930. Its director in 1972 was R. Gerald McMurtry. I sent him all the documentation I had found. He concurred this was the correct Pickett who had created the Lincoln portrait. 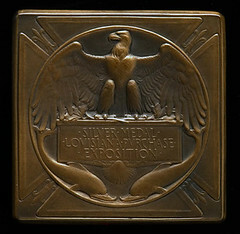 McMurty’s predecessor, Dr. Louis A. Warren, had written a full-page history of this plaque in the May 1955 issue of Lincoln Lore, the museum’s newsletter. This article revealed the fact the insurance company had acquired a large 25 x 19-inch oval plaque in 1922 from L.G. Muller of Chicago. Muller had acquired Pickett’s Lincoln in 1893 and made prints of the design. He had sent a print to the U.S. Post Office in 1909.The Post Office used the design on a one-cent post card in 1911 (Scott UX23), flipping the portrait to face left. It reissued the design in a different color in 1913 (Scott UX26). 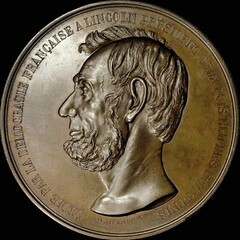 In 1963 Lincoln Life commissioned Medallic Art Company to issue a 3-inch oval medal using Lincoln Life's Pickett Head relief. 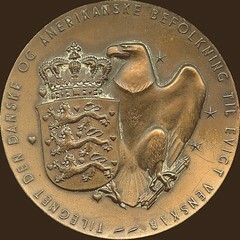 The medal was issued in bronze, silver – shown -- and goldplate. At the time of issue numismatist Ken Hallenbeck, later president of the American Numismatic Association, was an employee of Lincoln Life Insurance Company in Fort Wayne, Indiana. Ken had the presence of mind to order a Process Set – a set of medals withdrawn from production illustrating each step of manufacture– of this Lincoln medal made for his company. 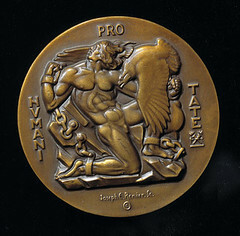 Process sets can only be made while the medal is in production. Further, he acquired one each of the bronze, silver and goldplate. Fast forward now to 2013. 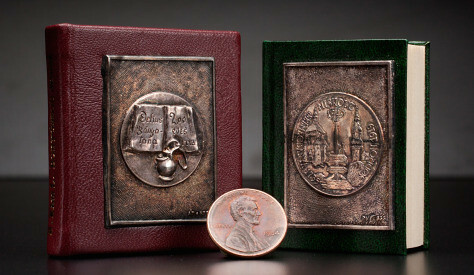 Fred Reed’s first book on Lincoln Images (2009), had mentioned one of these Lincoln plaques by Pickett made by a firm in Cleveland. But Fred had misspelled the firm’s name. It took me two years to track down the correct spelling and address of the Cleveland firm. A letter and two emails went unanswered, I called and talked to the proprietor. He had been travelling in Italy. He recognized my description of the Pickett Head relief and even volunteered he had two “castings” of it in storage. “Would these be for sale?” I cautiously asked. “Why yes,” and he gave more details which I was so elated I didn’t hear. Maybe it was that he was glad to dispose of them, they are only taking up room. “I’ll buy them both,” I said without asking any details, as size, composition, cost. I was glad to add another item to my Pickett collection. “I’ll have to color them,” he said, they were unfinished. We chatted about patinas, I subject I am fond of. For several years I had been corresponding with Ron Haney of Rochester, New York who is the great grand-nephew of artist Pickett. We learned Byron M. Pickett had a statue of Samuel F.B. Morse in New York’s Central Park and a few other sculptures, but Pickett never sought publicity, making later research difficult. I offered the second plaque to Ron. He was as elated at the prospect of owning a Pickett Head as was I. “Holy Cow!” It was the original 25 x 19-inch size! And the patina was beautiful as shown in the photo above. That’s still not the end of the story. 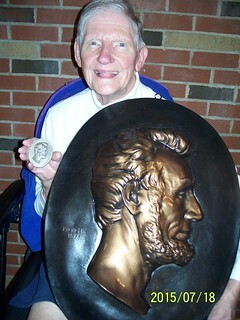 I had learned that Ken Hallenbeck was selling his 1963 Lincoln Life Medals and the Process Set. It took a bit of negotiating, but we finally agreed on a price. With these two acquisitions my Pickett collection had expanded immensely. Lot 251: United Arab Emirates Currency Board, Specimen Set of 4 Notes. 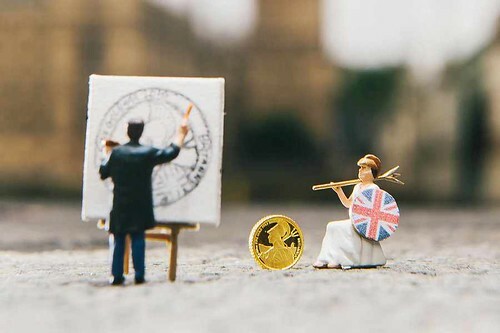 At first glance this may appear to be an artist putting the finishing touches to a painting - but these tiny figures have been commissioned by the Royal Mint to reflect the scale of the UK's smallest coins. Measuring just 8mm across and available in gold or silver, the delicate coins weigh a 40th of an ounce and form part of the Mint's new commemorative Britannia 2015 Proof Coin Collection. To mark the launch of the Proof Britannia 2015 collection, the Mint commissioned miniature sculptor, Roy's People, to portray the moment that the design of the coins came to life. The 2015 Britannia was designed by Anthony Dufort and the artist is depicted in miniature capturing the maritime design that appears on the reverse of the new collection. The new Britannia design is intended to have a simple and elegant feel, wearing her familiar Corinthian helmet and holding the trident, with a masted ship with billowing sails in the background. The obverse of the coins bears the new, fifth definitive portrait of the Queen, designed by Royal Mint engraver Jody Clark. “Most countries have no women represented on their banknotes at all. Out of the 14 countries listed in the table below only 11 per cent of banknotes include an image of a woman. ... 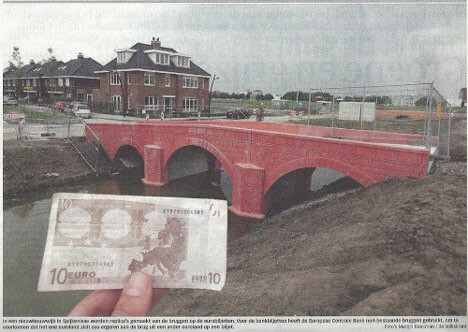 Some designs like the Euro don’t include people at all, depicting famous architecture instead." Ney ney, dear banknote aficionado — Euro banknotes have ZERO famous architecture on them — None at all. All images are imaginary sort-of-like someplace, but the competitive envy of the various nations caused Euro banknote developers to prohibit showing a specific, actual place in one country that would cause other nations to say, “hey – where is our monument?” Each of the coin-producing EU nations can feature whatever they want on the obverse of their coins, but the centrally produced banknotes follow different rules. This submitted by an old numismatist but new member who is working his way back in time through the issues. No corrective comment later on this was spotted. This fact may have been noted, but I submit this having not seen anyone else correct that comment in the last two years. The bridges were designed by Robert Kalina, an employee of the National Bank of Austria in the mid-'90s, as a tribute to European engineering. Kalina's bridges beat out more than 40 other designs in 1996 because, among other factors, they were totally uncontroversial. Each euro note's bridge represents a different European architectural epoch: classical, Romanesque, Gothic, Renaissance, Baroque and Rococo, industrial, and 20th century modern. The higher the denomination, the more recent the style. In the fall of 2009, Robin Stam was waiting to pay for his dinner at Angelo Betti, a busy pizzeria close to his house in Rotterdam. Sitting at his table, he noticed for the first time the series of small bridges that appeared on the back of his euro notes. A young graphic designer with a jagged mop of brown hair, Stam began to research how the drawings ended up on the back of the euro. When Stam, who has a rebellious streak, learned that the structures didn't exist, he decided to change that. 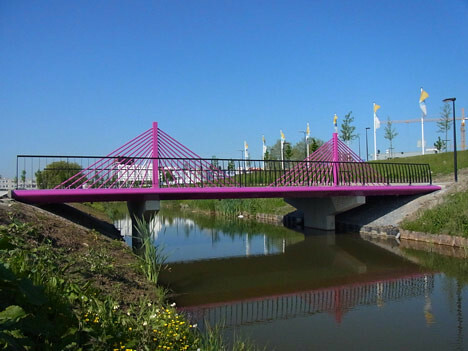 He would build the bridges for the first time in his hometown, the humdrum Rotterdam suburb of Spijkenisse. Stam set to work bringing the bridges, those woebegone symbols of European cooperation, to life. "I thought it was funny that me, just a regular designer, could take something that big and just claim it," says Stam, who is 30. His plan was to build the bridges exactly as they appear on the back of the bills, down to the pastel colors, which would enliven his drab portside suburb. 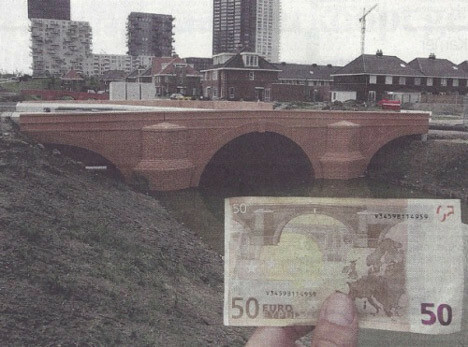 Partly for a laugh, Stam mentioned the idea of building the bank-note bridges to Spijkenisse Alderman Gert-Jan't Hart, who manages new construction projects on the city council. "I thought that was a brilliant idea," Hart says. "Every European citizen and every member of the European community who has the biljet in their hands will have a link to Spijkenisse." The town happened to be in need of a set of bridges to support car, bicycle, and pedestrian traffic over a creek surrounding a new middle-class housing development, Het Land (the Countryside). "We already reserved the money in our budget for six bridges," Hart says. Because the development needs six and not seven bridges, two of the seven bank-note bridges, the €5 classical and €20 Gothic bridges, are being built as a split-personality 20-meter-wide dam. Danny Spungen is a great collector. A bit eccentric. Crazy perhaps, but look who is writing this! I first met Danny in 2007 at an ANA summer seminar. ... Danny told me that he had just been to the annual convention of the APS—American Philatelic Society. Furthermore, he had made a major and completely spontaneous purchase there. It was a large award-winning exhibit of Holocaust material created by the well-known philatelist Ken Lawrence. Of course it was mostly philatelic. He mentioned the many covers from a wide variety of concentration camps that were in the collection. That really got my attention. I asked him if he knew that for many of the camps represented in his collection there were also paper money issues and that there was a numismatic book on the subject? That really got his attention. Within two minutes I handed Danny my cell phone with Steve Feller on the other end. Danny did not even finish his lunch. Fast forward a year. We are in Colorado Springs again for the seminar. This time Danny is in our class. On the critical day in question, I ever so slightly introduced Operation Bernhard, Nazi counterfeiting of Bank of England notes. Danny was smitten. I could tell it instantly. Operation Bernhard is of course an important and fascinating numismatic story, but it is just one of many that we cover in the class. I moved on, but Danny refused. First he studied every word that we have in World War II Remembered, then Brian Burke’s book on Operation Bernhard, which I had in the classroom. Along the way he was scouring the Internet for more. I had lost him for the class, but we had also won him over to the community long term. Danny told me recently that at the time of the class he actually owned a Bernhard note in the Holocaust philatelic collection, but that he had neither appreciated nor understood it until the class. Therefore, I think that I can claim credit (or blame) for setting him on the path that he has taken. Jump forward a few weeks (24 August 2008). Danny called me that he was on the road heading for Ohio. 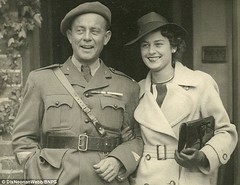 Danny said that had found a survivor of Operation Bernhard. He lived in Mansfield, Ohio. Danny was going to visit him, did I want to go along? Oh my, what a request. I was thrilled to have the opportunity. Danny picked me up and we were on our way. We arrived in Mansfield (just the two of us) in good order, bursting with enthusiasm and questions. We were greeted by Hans Walter, who was indeed a survivor of Auschwitz, transferred to the Sachsenhausen concentration camp as a member of Operation Bernhard. Until our meeting, Hans’ story, from what we gathered, was printed only a few times in the local Plain Dealer and The Daily Record newspapers. We were surely going to change that! ... Hans became a final inspector of notes. Likely he had other jobs along the way, but it was the inspector job that he described the most to us. Hans was very proud to say that he was in charge of the final inspection stages (of which there were about five). After the war Hans came to the United States, where he married, raised a daughter, and worked at the General Motors factory in Mansfield. We showed Hans a few Bernhard notes that Danny had taken along. Hans confirmed that they were indeed Bernhard notes, although I do not know how he identified them. Danny was quick to tell Hans, that “we collectors can pretty easily distinguish a genuine from a counterfeit note.” Hans was disturbed by this “accusation,” because he said he would not be living today if it was easy to detect the differences. In fact, he started to shake his little four-legged card table, saying it was not easy. After a discussion, we back-tracked and told him that “today,” given all the information we have, it is easy, but of course back in 1944 it was not easy at all, and that is why the operation was so successful! Hans indicated that these were the first examples that he had seen since the war. “Caligula” is a nickname. It means “little boot” in Latin, because as a child he wore a miniature military uniform including tiny hobnailed boots, much to the delight of his father’s veteran legionaries. He grew up to dislike the nickname. 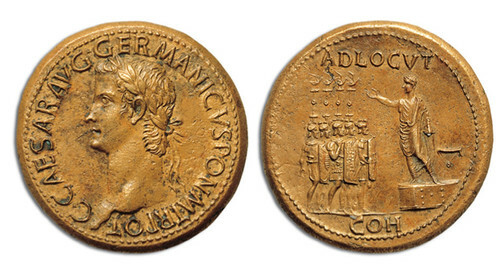 His given name, which appears on his coins, variously abbreviated, was Gaius (or Caius) Julius Caesar Germanicus. “Caesar” here is not a title, but a personal name, inherited through Germanicus Julius Caesar, grandson of Emperor Augustus, the adopted son of the famous Julius Caesar (100 – 44 BCE). When the reclusive, miserly and increasingly paranoid Emperor Tiberius died on 16 March 37 at the age of 78, most Romans greeted Caligula’s accession joyfully. Caligula’s early coinage celebrates his descent from his great-grandfather, the deified Augustus. Caligula’s laurel-crowned portrait appears on the obverse of his gold aurei and silver denarii surrounded by his titles. On one reverse, which bears no inscription, the head of Augustus, wearing the sun god’s spiky radiate crown, appears between two stars. Another type omits the stars and adds the inscription, “Divine Augustus, Father of the Nation.” On some examples, the portrait seems to have the features of the unpopular Tiberius, who was never deified by the Senate. Perhaps the mint engravers, who had copied and recopied the portrait of Tiberius for 22 years, automatically reproduced a familiar face. The orderly succession and survival of any Roman emperor depended on the Praetorian Guard, an elite force of bodyguards stationed in the capital. It was organized into nine battalions or “cohorts” each of 500 – 1000 men. 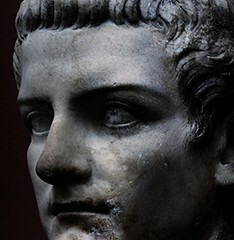 On his accession, one of Caligula’s first official acts was to present each guardsman with a thousand sestertii bequeathed by Tiberius in his will, adding another thousand of his own. The reverse of a rare bronze sestertius, which may have been specially struck for this payment, shows Caligula standing on a platform with his arm raised in a formal gesture of greeting to a rank of guards. The abbreviated inscription ADLOCUT COH means “Address to the Cohorts.” Remarkably, this coin lacks the inscription SC (“by decree of the Senate”) which normally appeared on all Roman bronze coinage. An outstanding example of this type (“undoubtedly the finest specimen known”) brought over US$634,000 in a 2014 European auction. FRIENDS of the Newport Medieval Ship are to make a new pilgrimage to a French town that minted the rare coin sealed in the shipping vessel’s keel as a good luck charm. Newport historian Charles Ferris and Friends of The Newport Ship chairman Phil Cox will in September attend a medieval festival in Cremieu, East France, the place where the piece was struck in 1447. A scientific study of the 15th century ship’s timbers shows the wood used to build it was felled in the Basque region bordering France and Spain. 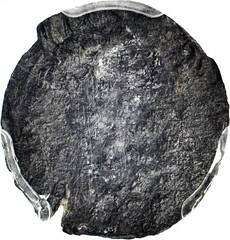 Meanwhile, the provenance of the medieval coin confirms the 100ft vessel’s connections with France. Mr Ferris, a Newport councillor for Allt-yr-yn ward, attended the festival in 2010 and will return to the town set to mark the 700th anniversary of its charter on September 12. Mr Ferris said: “It’s wonderful that our two cities are linked by the discovery of the good luck coin in the fabric of the Newport Ship. “The Basques didn’t have a currency of their own and were using French and Iberian coinage at the time. 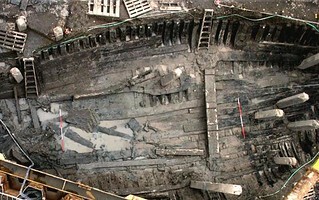 Unearthed during building works of the Riverfront Theatre on the bank of the River Usk in 2002, the Newport Ship has been the centre of considerable interest among maritime historians and the wider academic world. Historians believe the piece was minted by Jacques Vincent, a coiner of Cremieu who sadly went blind after years of careful engraving. It is thought shipwrights then sealed the coin into the vessel's keel in about 1450. In reference to the wooden bolted block "found in a barn" with the impression of the seated liberty dime in lead within it - This is a cornerstone piece. It was constructed like this to contain a coin dated the same year that the given building was constructed. Such cornerstone blocks were almost always make-shift and came in a variety of shapes and forms, but were almost always preserved in lead being softer than the coin itself. They were simple time capsules! Over the last 50 years, I have encountered about two dozen different pieces in the US, Germany, France and Belgium. It appears that this piece was opened, checked and replaced in the block, thus the double impression. This is one of the more elaborate pieces I've seen. 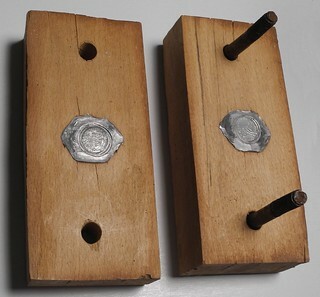 The simplest such item I've encountered was just a sheet of lead folded several times and placed inside a red brick block which was hollowed out to accommodate it, but pieces of wooden structure like this one were also placed in wooden buildings and barns to commemorate barn raisings and other constructions. Sorry, but I never collected such items, and have no examples to show, although I did once own a piece from the stone bank building in Abington, Massachusetts that burned down in the 1960's which I no longer own. I've owned three coin shops over the years, two in Tacoma, Washington and one in Hanover, Massachusetts, and while stationed in Europe have done over a thousand coin shows and mini-show coin-meetings off and on between 1965 and 1988. 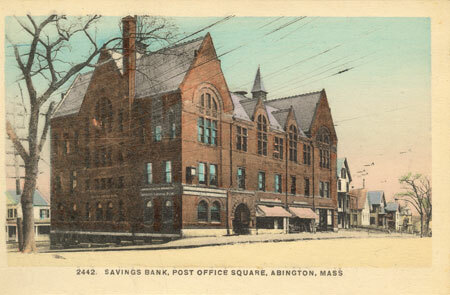 I mentioned the Abington Savings Bank in Abington, Mass, the cornerstone piece was an 1883 dollar inside a folded piece of lead (Probably roofing material) placed inside a tin (a pill tin, I believe) enveloped in sand and placed inside another tin probably a tobacco tin which was exposed to fire. The bank was built in 1883 and burned on 26 November 1960. My family (the Blanchards) were long time members of Abington and that's how I got it years ago. Wish I had kept it now! I'm attaching an image of the old bank building that burned. I have given this subject some thought and recall various pieces from various locations - naturally the coins were all uncirculated. One piece from a cigar store in Yelm, Washington, and another from the old sheriff's office in the same vicinity. A Napoleon III, 10 centime piece dated 1863, from either Tours or Poitiers, France, and another from a bank building in Milton, Mass that my uncle renovated in the 1980's which had a 1876 BU half as its corner stone piece. Although he brought me the half he told me "When we pulled down the walls, we found hundreds of thousands of checks between the brick and interior paneling. It took two guys from my crew all afternoon to clean them out and burn them. I brought a few cancelled checks for you to see along with the corner stone coin." All checks were pre 1910 and had revenue stamps attached! I've seen several Dutch and German pieces - from Tilburg, Holland; Aachen, Germany, and the old brewery building in Primasens, Germany. One day in March 1963, as workers were building Houston’s Astrodome, politicians and business leaders gathered at the construction site. They held a brief ceremony and placed a time capsule of mementos into a hole. Workers then covered it over and resumed construction of the 9-acre complex. Earlier this year, Ed Emmett, the top elected official in Houston’s Harris County, saw a photo of the event accompanying a newspaper article. He asked his staff about it. “They all went, ‘What time capsule?’” he says. Mr. Emmett sent in the sheriff’s bomb squad with ground-penetrating radar to find the capsule. Their hypothesis: it is likely buried under a concrete support. But digging for it could structurally damage the dome, they say. “Basically we don’t have any idea” where it is, Mr. Emmett says. Many people, from small town mayors to the late Apple Inc. co-founder Steve Jobs, have felt the need to memorialize the present by sending a love letter to the future. But most time capsules are lost, says Paul Hudson, a 64-year-old history professor at Georgia Perimeter College and president of the four-member International Time Capsule Society. Even the time capsule that inspired the society’s creation—the “Crypt of Civilization” at Oglethorpe University outside Atlanta—was itself forgotten for decades. Mr. Hudson was an Oglethorpe undergraduate in 1970 when he stumbled on the crypt’s sealed door in a basement hallway crammed with text books and junk. It was one of the most famous time capsules in the world when it was sealed with fanfare in 1940. It isn’t supposed to be opened until the year 8113. In 1990, on the 50th anniversary of the crypt, Mr. Hudson and three other men launched the society to spark interest in time capsules and teach best practices. Many capsules are lost to poor record keeping or forgetfulness, says Mr. Hudson, who students once called “the crypt keeper.” Others are stolen, vandalized or so poorly made they collapse into a “soggy mess” when recovered, he says. The society estimates 9,000 of the world’s 10,000 time capsules have been lost. “Lots of people just poop out,” says Will Jarvis, 70, author of a book on time capsules and another society co-founder. In 1983, actors from the television show “M*A*S*H” decided to bury a medical chest full of souvenirs—dog tags, a rosary, surgical clamps—on the Hollywood set where the show was filmed, according to Alan Alda, a star of the show. They were taking a cue from an episode in which the characters bury a time capsule, he says. The actors hoped the capsule would stay buried for 50 or 100 years, he says, but about a month or two later the land was sold off for an office building. A construction worker found the chest and called to ask what to do with it. They told the man he could keep it. “And it’s the last time I’m going to have anything to do with a time capsule,” Mr. Alda said in an email. 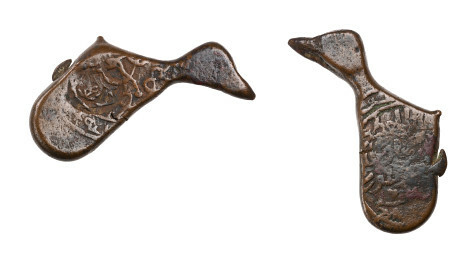 Amid the expansion of the Georgian kingdom and its cultural flowering, this period also produced some of the strangest and most fantastical coinage ever minted in the region. All coinage from this period was bronze (because of the ‘silver famine’ in the Middle East). 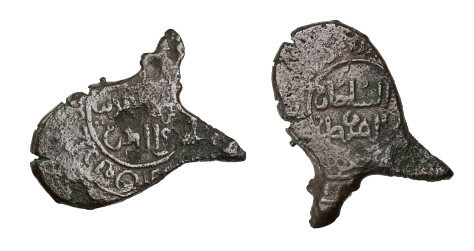 While some pieces were struck on regular round planchets, others clearly were not– like this coin of Queen Tamar herself. 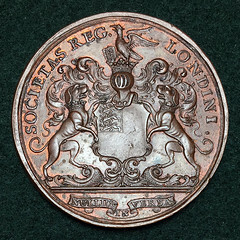 It is a so-called ‘irregular bronze.’ On the obverse, the central image is Queen Tamar’s monogram within a wreath. Surrounding this is a marginal legend written in the Georgian Asomtavruli script. "The Internet's Impact on Numismatic Journalism"
Charles will be joined by Wayne Homren, editor of the Numismatic Bibliomania Society’s weekly e-publication, The E-Sylum. Two other prominent speakers will join them and will be announced. I just wanted to say thank you to all those who have pre-ordered a copy of my Early Half Dollar book and to let you know that I will have the finished books with me at the upcoming ANA. I pick them up on Monday 8/10, so I will be unable to ship any until the following Monday. I will however be happy to deliver any that were pre-ordered directly at the show. Speaking of pre-orders…I am extending the special price of $79 until 8/8. So if you have been putting it off, you better get your order in before the 8th to save some money! 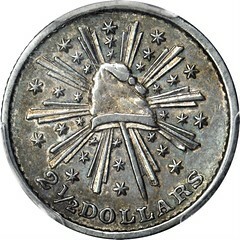 See: www.earlyunitedstatescoins.com. Also I will be doing a book signing on Thursday from 4:30 pm - 5:30 pm and on Friday from 2 pm - 3 pm at the Central States Numismatic Society table - #1948. 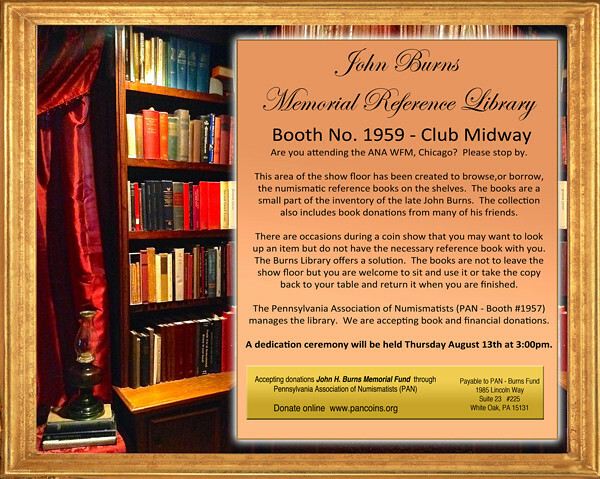 There will be books available for sale at the table throughout the show, but at the normal cover price of $89. Looking forward to seeing everyone next week! I will be conducting a Money Talks presentation at the ANA World’s Fair of Money in Chicago on Wednesday, August 12th at 4:00 PM in Room 6. My presentation is titled “The Workflow of the First United States Mint”. Mint related documents from the National Archives and Library of Congress that were not previously included in my John Reich Newsletter articles have been incorporated into my presentation. An Armenian numismatic roundtable will be held in conjunction with the Chicago ANA World's Fair of Money. Scheduled for Wednesday, Aug. 12 at 2 PM., Room 24 of the Donald Stephens Convention Center in Rosemont, the two hour meeting will feature an open discussion led by noted dealer Frank Kovacs and researcher L. A. Saryan. 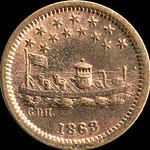 Join Dave and Susan in this exciting presentation of Patriotic Civil War Tokens. See what the 6th Edition of Fuld’s Patriotic Civil War Tokens holds for the collector. 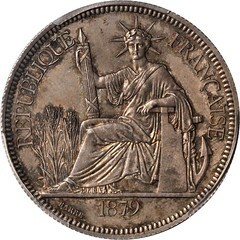 Enjoy the narrative and pictures of some of the most interesting of Patriotic Tokens. 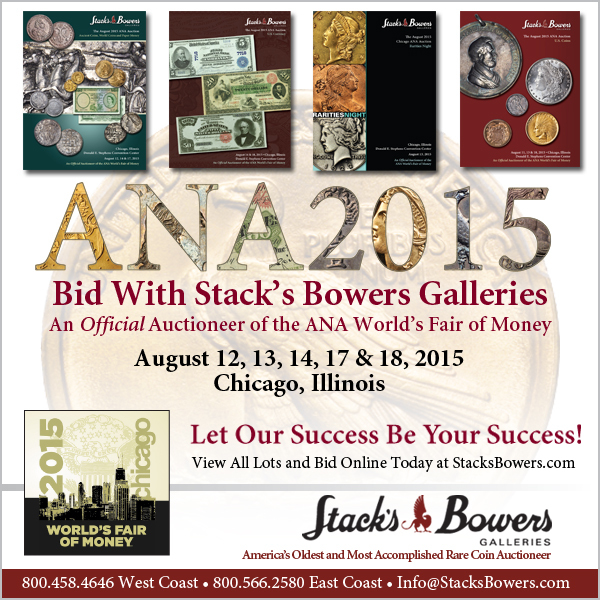 The presentation begins at 3:00 pm on Thursday, August 13th at the ANA World's Fair of Money in Chicago. Confederate Officers imprisoned on an island north of Sandusky, Ohio in Lake Erie. What was daily life like? What about the chance of escape? What was offered for sale by the camp sutler to make life easier? Multiple media outlets reported Monday that boat captain Eric Schmitt and his family made the find June 17 in about 15 feet of water off Fort Pierce. Brent Brisben is the co-founder of 1715 Fleet - Queens Jewels LLC, the company that owns the treasure's salvage rights. He says the items recovered include 51 gold coins and 40 feet of ornate gold chain. Among the findings is a rare coin called a "Royal" that was destined for the King of Spain. Brisben says the artifacts date from a 1715 maritime tragedy in which 11 Spain-bound galleons laden with treasures from the New World were lost during a hurricane. “These finds are important not just for their monetary value, but their historical importance,” said Brisben. 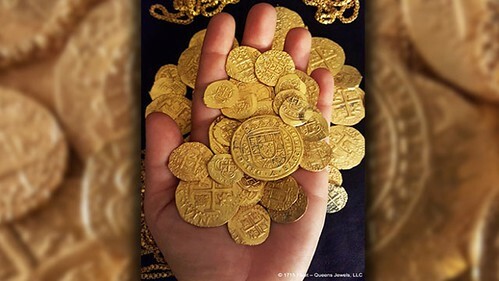 Treasure hunters off the Florida coast recently pulled up the haul of a lifetime: nearly $1 million worth of gold coins and elaborate gold chains, as well as an extremely rare Spanish coin known as a "Tricentennial Royal." The treasures were hidden on the seafloor for 300 years before the crew of a salvage vessel brought them to the surface last month, on June 17. 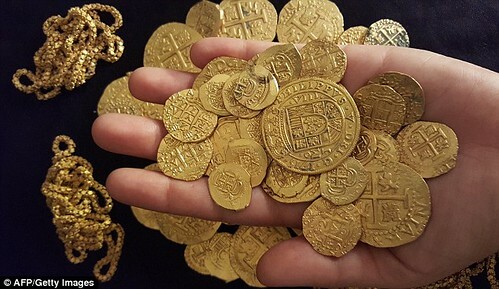 The riches were found just 1,000 feet (305 meters) offshore of Fort Pierce, Florida, according to Eric Schmitt, captain of the aptly named salvage vessel, Aarrr Booty, which was used to locate the treasure. A hurricane off Florida sank all but one of the 12 ships on July 30, 1715. The so-called "1715 Fleet" has been a treasure-hunter's fantasy ever since. In 2010, Brent Brisben and his father, William, obtained permits to explore the wrecks in search of sunken riches. The lucky haul off Fort Pierce was the work of the entire Schmitt family, which includes Eric and his wife, as well as Eric's sister and parents. The Schmitts were subcontracted to explore the 12 different shipwrecks for Brisben's company (1715 Fleet Queen Jewels, LLC), which owns salvage permits. Included in Aarrr Booty's recent haul were 51 gold coins and 40 feet of golden chain. 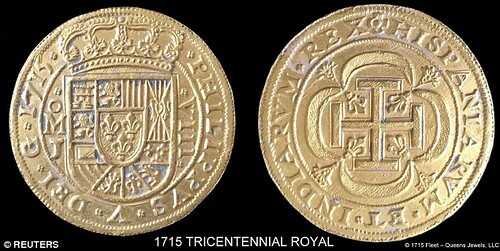 But the real treasure salvaged from the deep was the rare Tricentennial Royal, one of very few gold coins minted for King Philip V of Spain, according Schmitt, lead diver of the Aarrr Booty vessel's treasure-hunting expeditions. The coin is "very round" compared to most coins salvaged from the wrecks, said Schmitt, who told Live Science that the royal coin was die-cast (made by pouring molten gold into a coin mold). 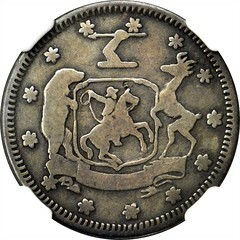 Most Colonial coins from this period were made using cruder methods that resulted in less uniform shapes, according to the coin-collecting website Coinquest. The round royal coin, which is about the size of a silver dollar, is worth an estimated $500,000, according to Brent Brisben. And even though Brisben and Schmitt are excited about the discovery of this precious coin, both remain hopeful that even more treasure lies hidden off Florida. Brisben's company owns the salvage rights to five of the 11 ships that sank on July 30, 1715, he told Live Science. He estimates that $440 million worth of coins and other treasures have yet to be recovered from these centuries-old wrecks. Among the treasures that are still at large are the elusive queens jewels, which belonged to Philip V's second wife, Elizabeth Farnese, Duchess of Parma. The elaborate jewels were to be a part of the queen's dowry and were supposed to be brought to Spain by the 1715 Fleet. Because jewelry wasn't a taxable commodity in Spain at the time, details about the jewels weren't entered on any official documents, but a few ornate items were allegedly aboard the fleet when it sank, including a 74-carat emerald ring and 14-carat pearl earrings, according to Brisben.